O – Art for Art's Sake! 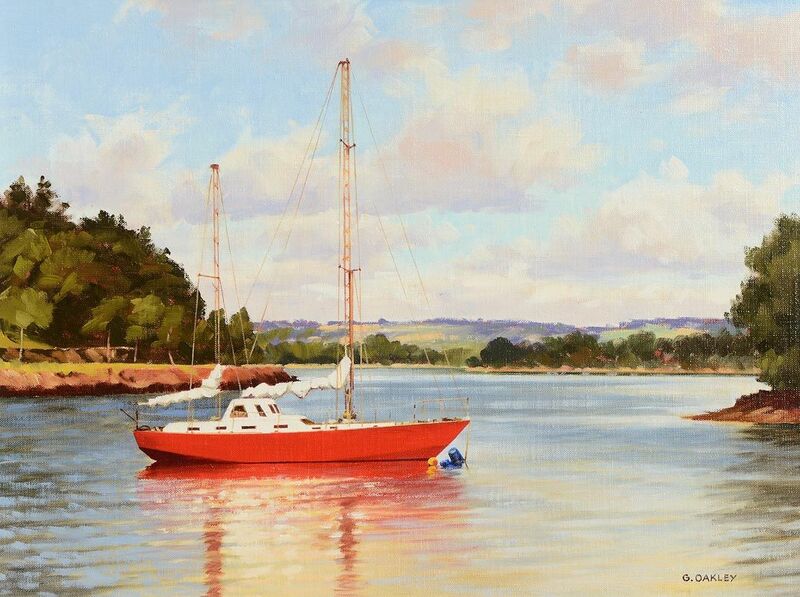 “Moored at Crosshaven” oil on canvas board (12″ x 16″), sold at Morgan O’Driscoll’s – 25/9/2017 for €220.00. Dublin born Landscape and Still Life artist. “A View of the Liffey” oil on canvas (15.5″ x 12″) sold at The Dublin Painting and Sketching Club 2018 Exhibition. Cora is a Dublin based artist and a graduate of NCAD and DIT. She has had many solo exhibitions and has also participated in group shows. 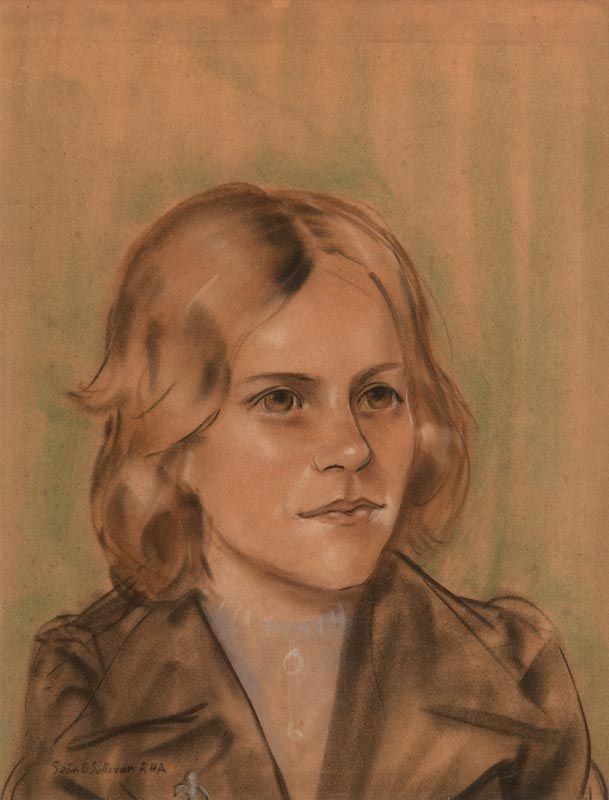 Her work is in private collections in Ireland and abroad, as well as in the collections of Aer Lingus, The Law Society and Tallaght Hospital. Noted landscape painter and sculptor. 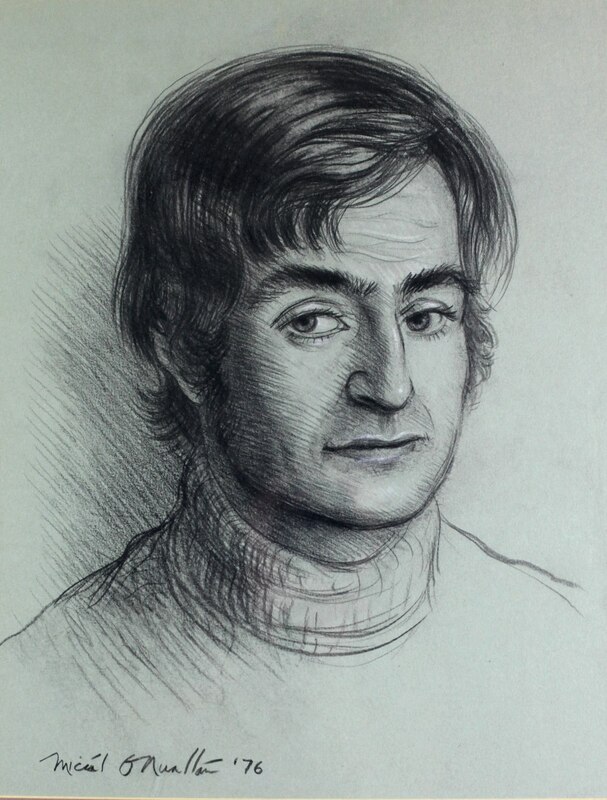 Father of artist Senan O’Brien. 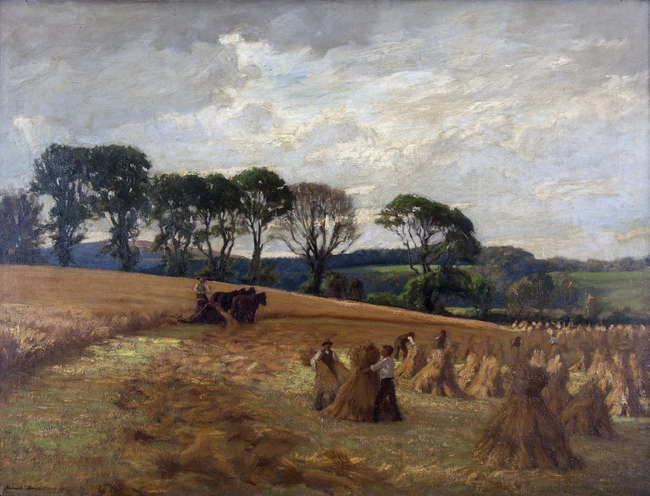 “Heading the Stooks” dated 1923, oil on canvas (29″ x 39″), sold at Adam’s – 28/9/2016 for €8,000.00. 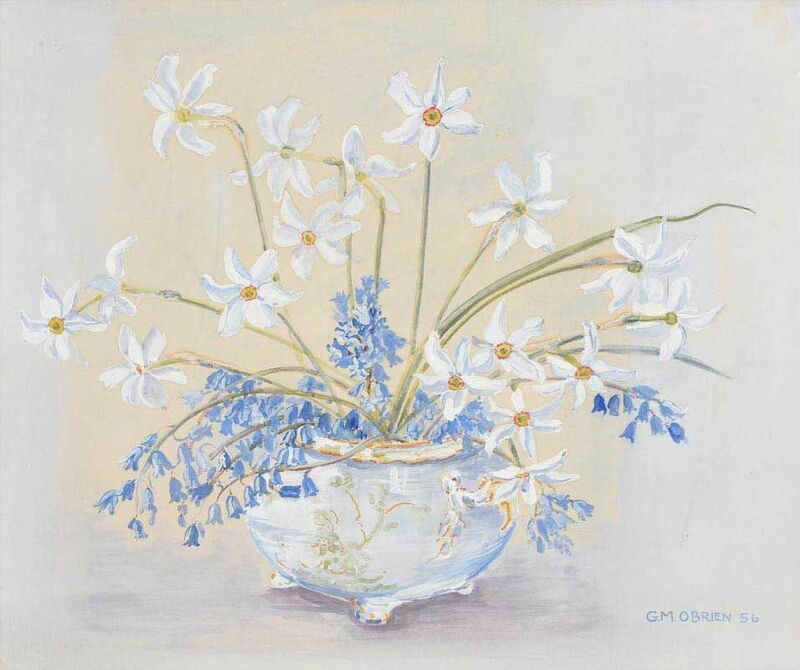 Daughter of the artist Cecily O’Brien she was a regular exhibitor at the RHA from the 1940s to the 1990s. 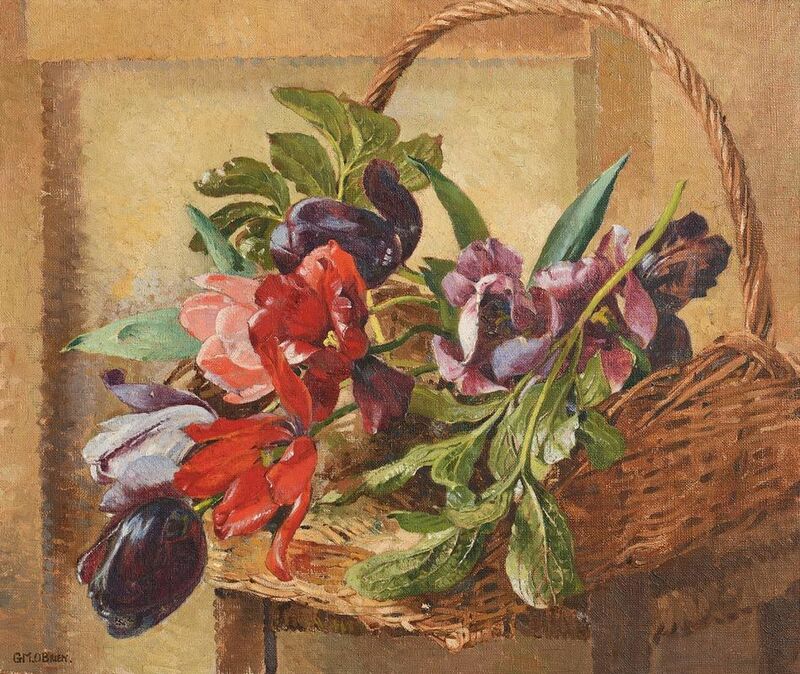 “Still Life” watercolour (15″ x 18″), sold at Morgan O’Driscoll’s -30/1/2017 for €400.00. 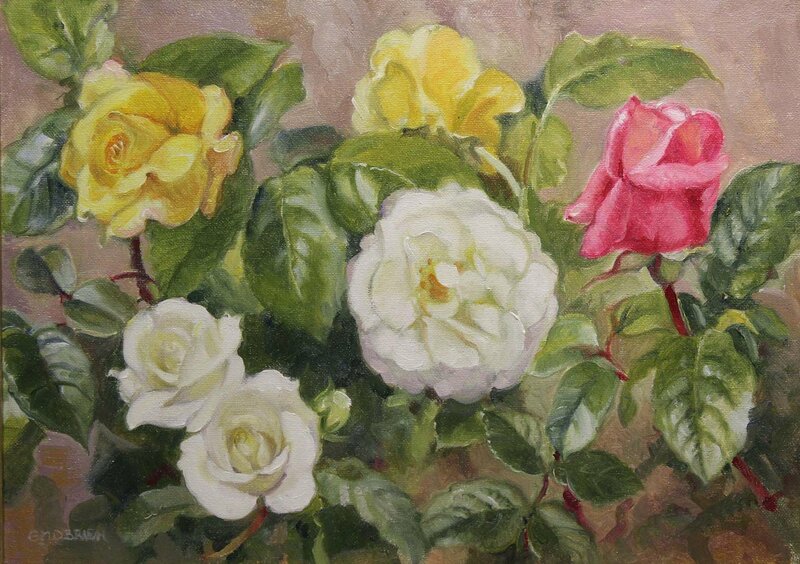 Left to right: “Tulips” oil on canvas (7″ x 23″), unsold at Morgan O’Driscoll’s – 22/1/2018; and “Roses” oil on canvas (10″ x 14″). 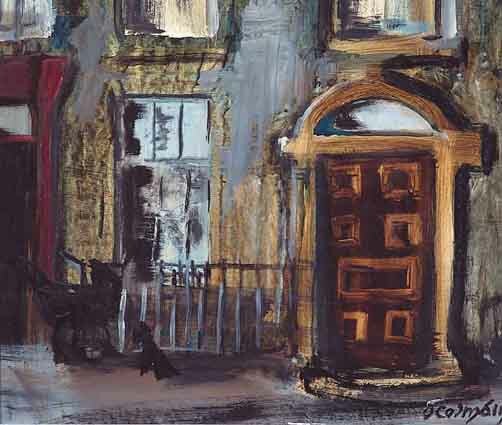 “View of Cook Street, Dublin.8.” oil on canvas (17″ x 26″), sold at Morgan O’Driscoll’s – 21/5/2108 for €480.00. 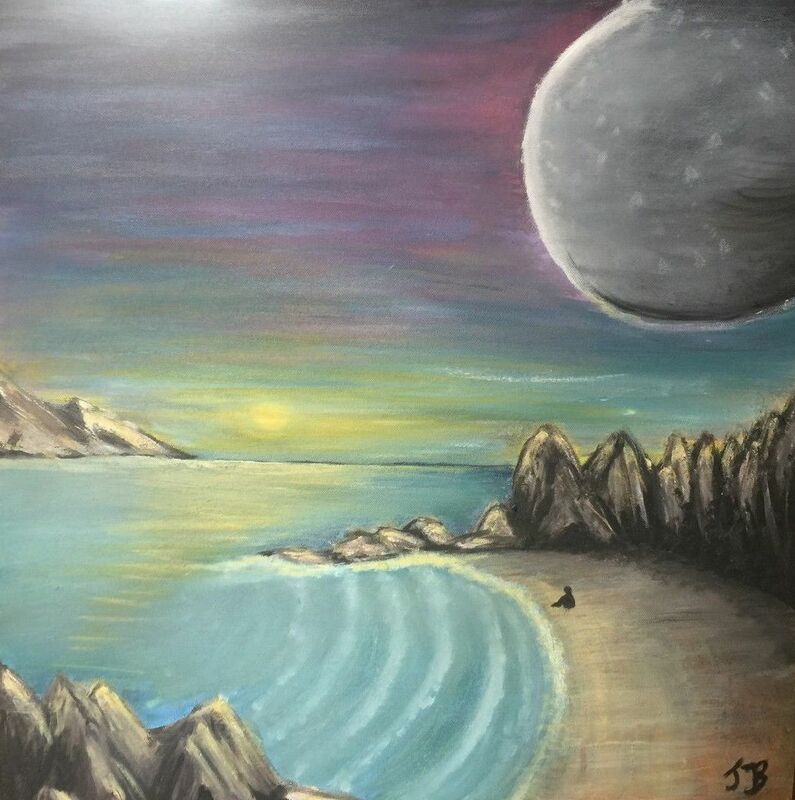 Landscape artist both traditional and abstract. 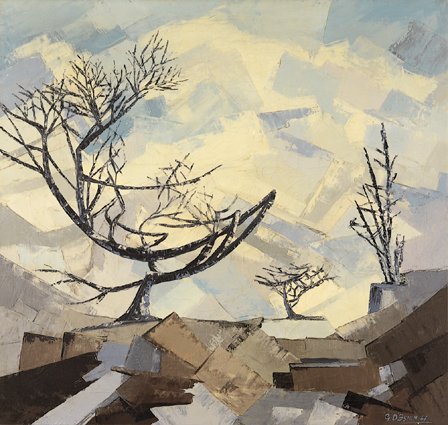 “Landscape” dated 1966, oil on canvas (34″ x 36″), sold at Whyte’s – 8/3/2000 for €609.00. 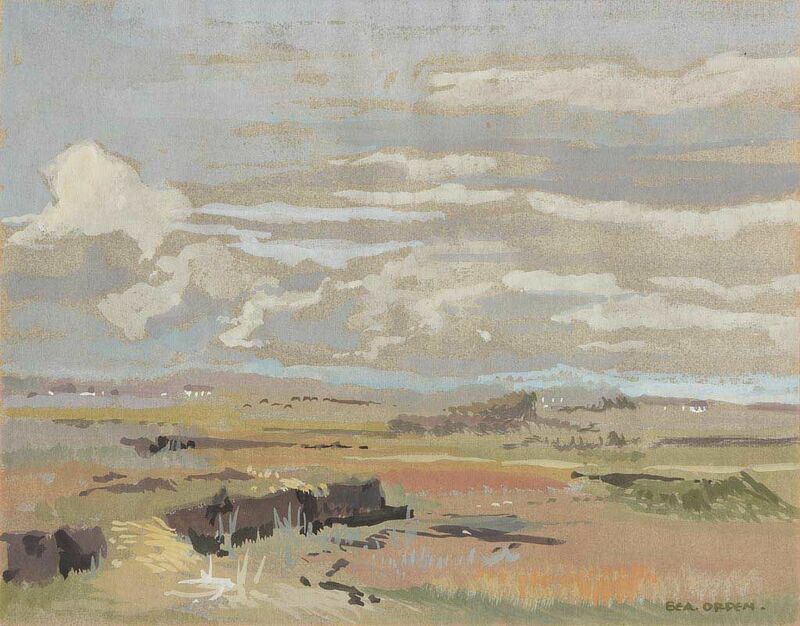 “Hilltop View” dated 1978, oil on canvas (18″ x 26″) – unsold at Adam’s – 13/12/2016. 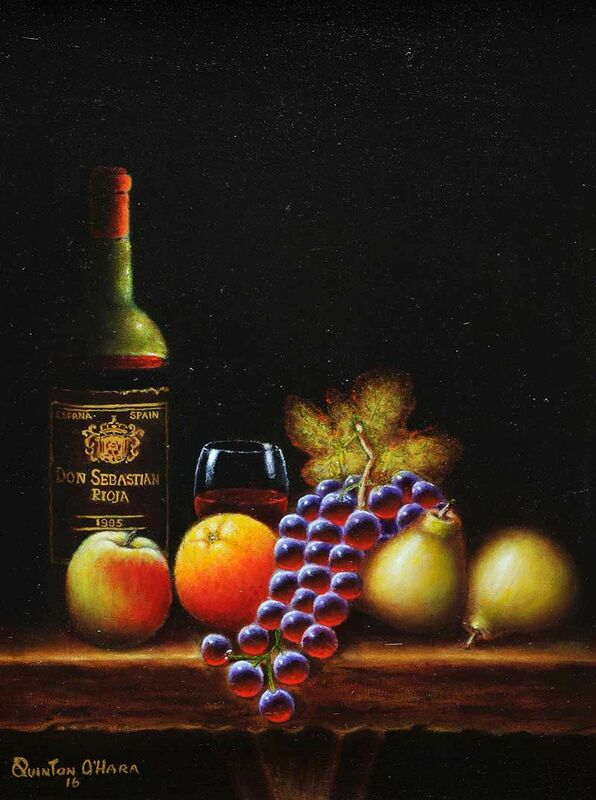 “Appreciation” oil on canvas (24″ x 24″). 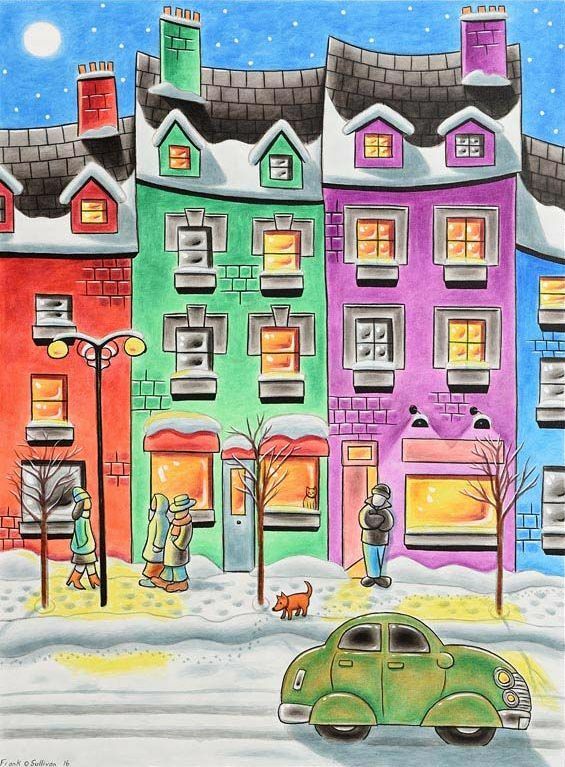 More from the artist here: Jackie O’Brien. 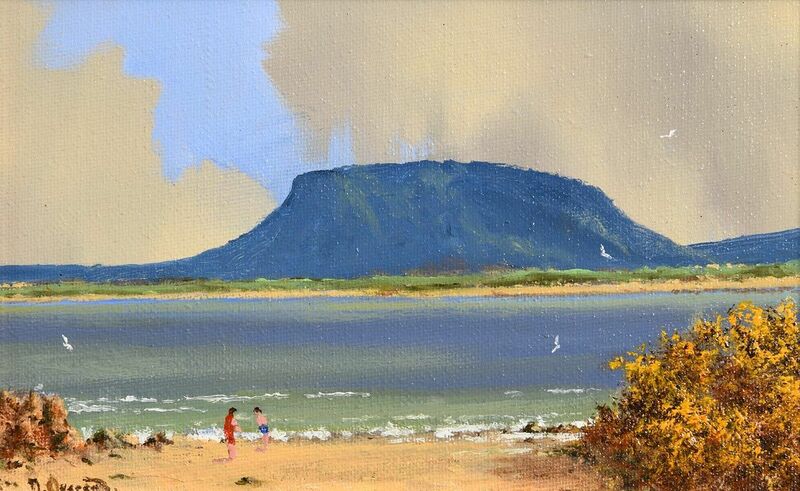 Wexford landscape artist and maths teacher. 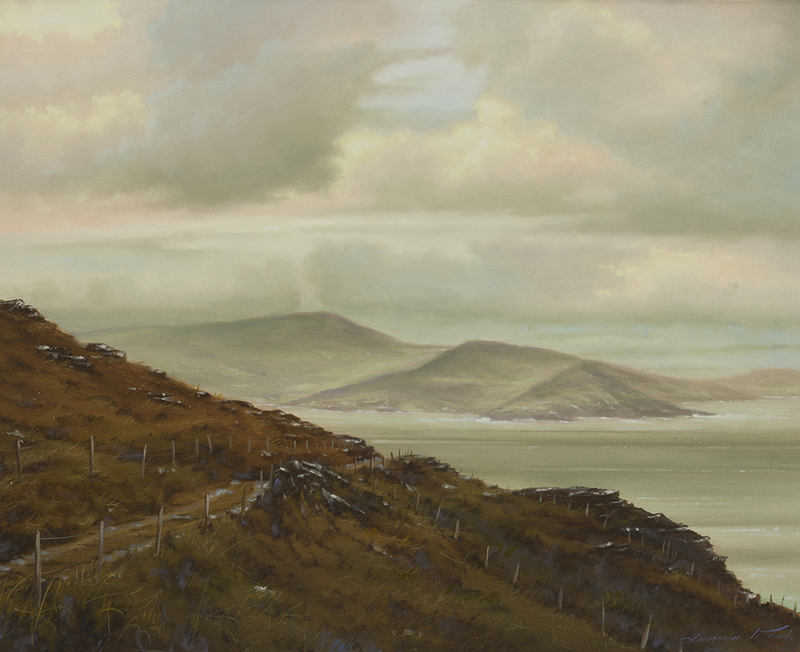 “Bunnacurry, Achill” oil on canvas board (18″ x 23″), sold at Dolan’s ‘Rosslare Sale‘ – 30/4/17 for €320.00. “Studying the Form” dated 2002, oil on board (10″ x 15″), sold at Morgan O’Driscoll’s – 22/1/2018 for €550.00. “Double Check” dated 2015, oil on canvas (19″ x 23″), sold at Morgan O’Driscoll’s – 25/6/2018 for €320.00. 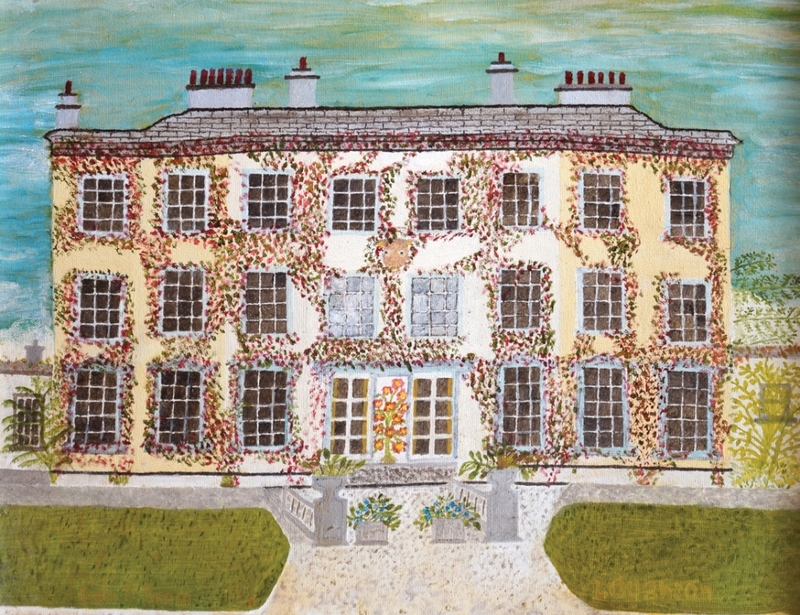 “Loughton House” oil on canvas (16″ x 20″), offered at Sheppard’s 29/9/2016. 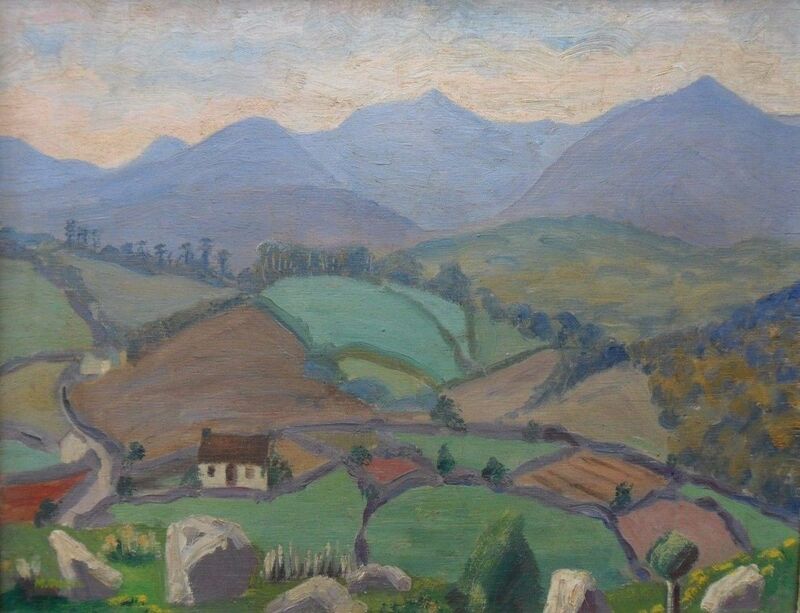 “Connemara Landscape” dated 1975, oil on canvas (17.5″ x 24″), unsold at Morgan O’Driscoll’s – 28/1/2019. 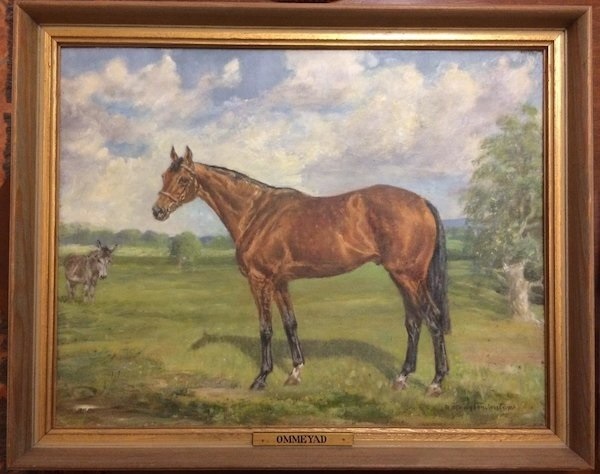 “Ommeyad” oil painting of the 1957 Irish St.Leger winner. 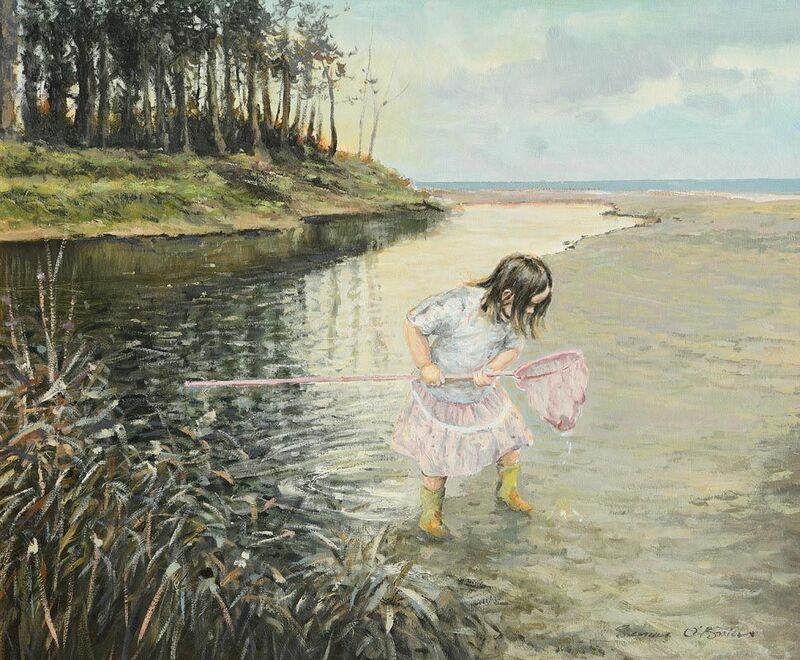 “Fishing the Lake” oil on board (16″ x 20″), unsold at Morgan O’Driscoll’s – 26/6/2017. 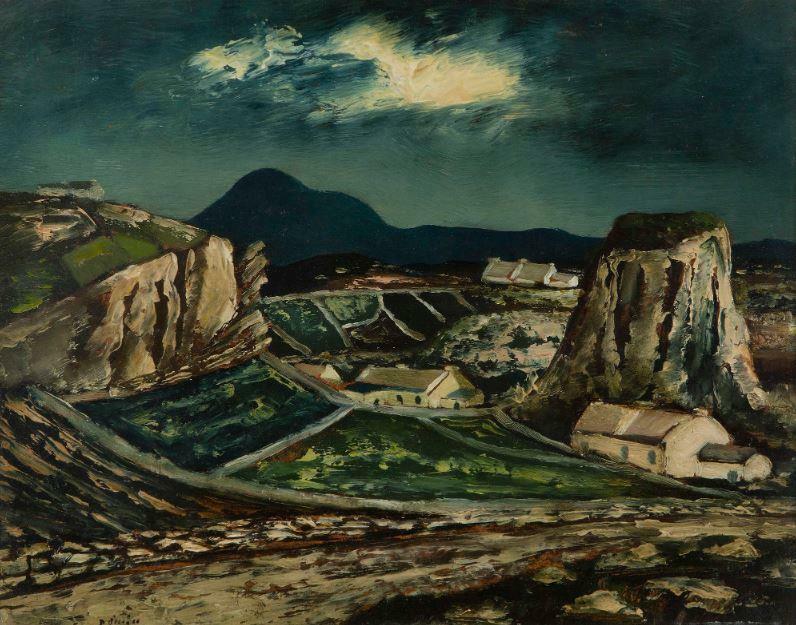 Blaithin O’Ciobhain was born in Dublin and attended the National College of Art and Design where she studied under Keating and graduated with honours from the School of Painting in 1958. In 1960 Blaithin joined RTE where she wrote and presented “Lets Draw with Blaithin”, the world’s first televised fine arts masterclass. 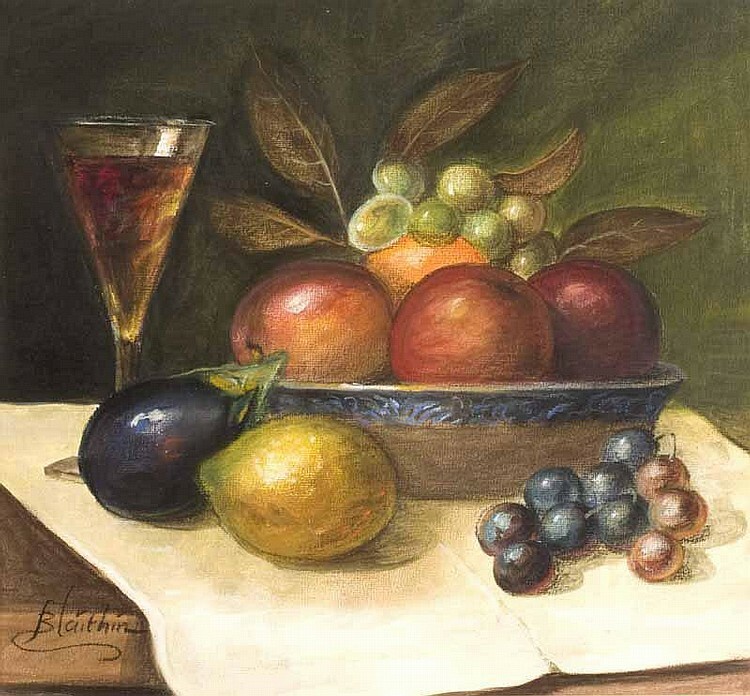 “Bowl of Fruit” still life, pastel on paper. 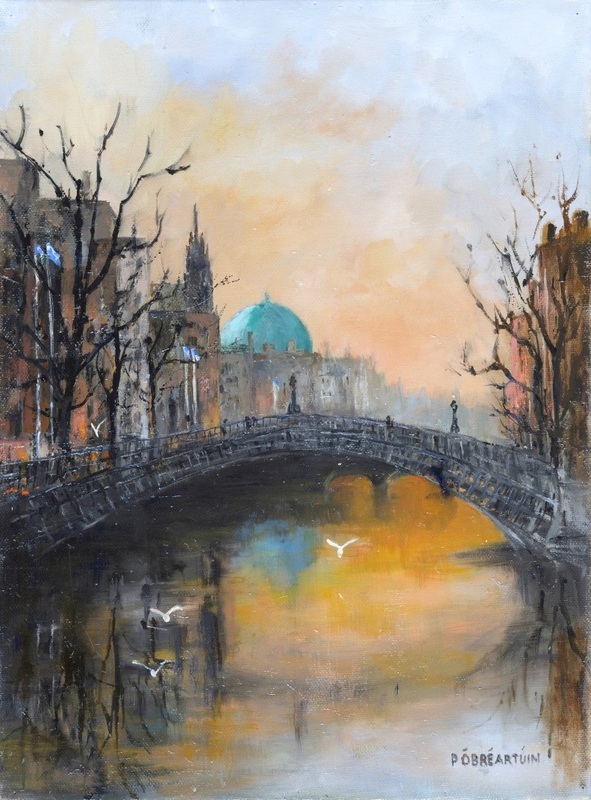 “The Four Courts, Dublin” oil on board (31″ x 44″), sold at Adam’s – 29/3/2006 for €4,000. 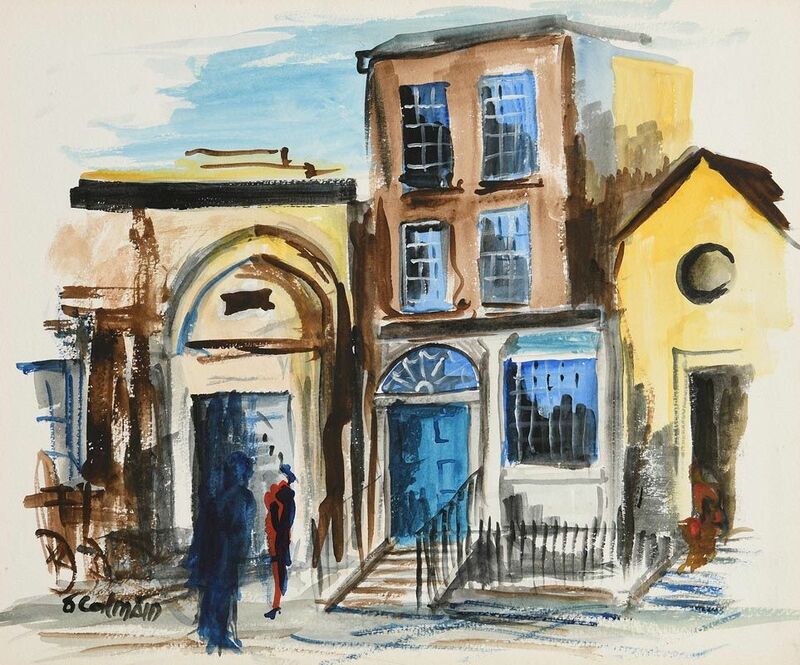 Left to right: “Old Doorway” oil on board (12.5″ x 15″), sold at Whyte’s – 13/3/2001 for €2,031.00; “Gossip” watercolour (8″ x 10″), sold at de Vere’s – 18/7/2018 for €135.00; and “Where Handel Played” watercolour (15.5″ x 18.5″), sold at Morgan O’Driscoll’s – 7/8/2018 for €550.00. 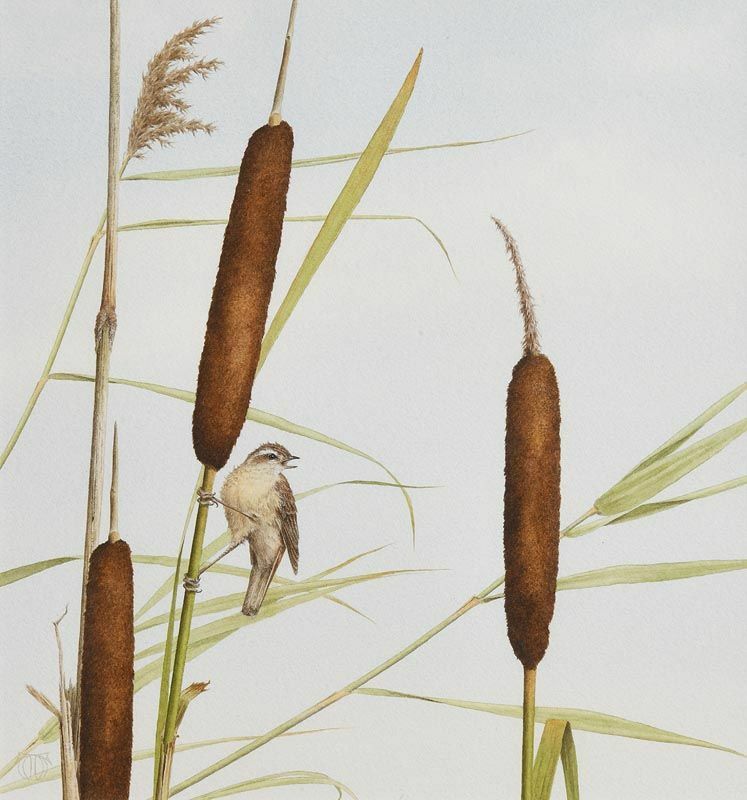 “Sedge Warbler” watercolour (13″ x 12″), sold at Morgan O’Driscoll’s – 29/1/2018 for €220.00. “Wicklow landscape with solitary figure” oil on canvas (14″ x 18″), sold at Whyte’s – 9/10/2001 for €5,713 including buyer’s premium. 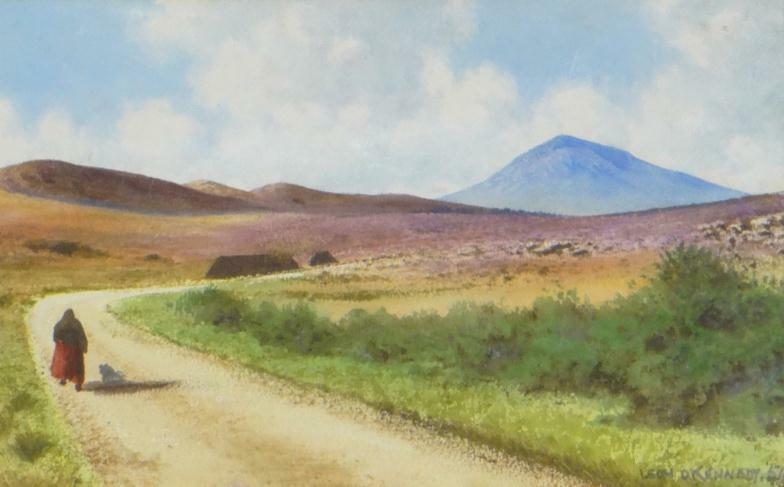 “Old Mile, Beggars Bush” watercolour (6″ x 9″), sold at Sheppard’s (Durrow) – 26/9/2017 for €750.00. 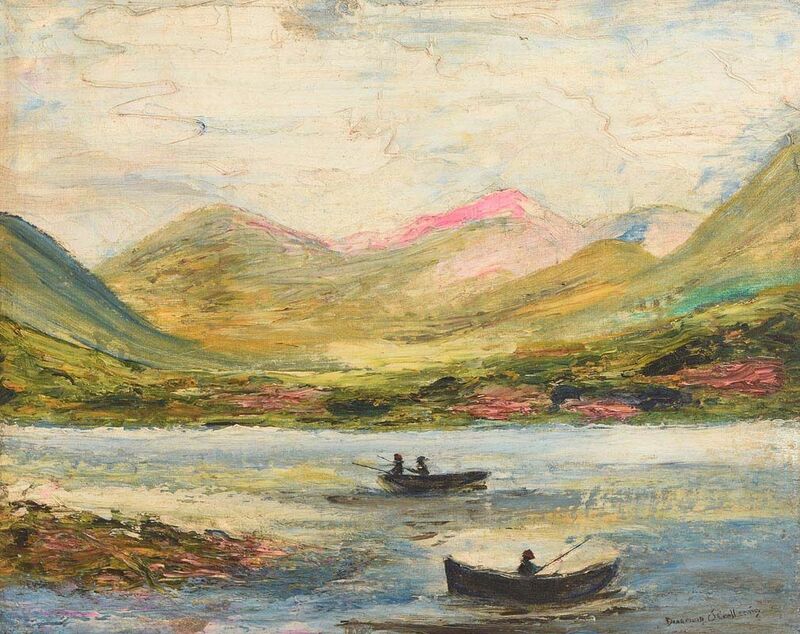 “Jack B Yeats” oil on canvas (23.5″ x 19.5″), sold at Whyte’s – 10/10/2000 for €4,444.00. 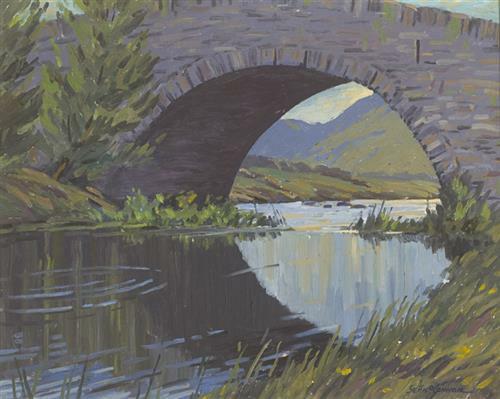 “Bridge on the Loe, Killarney” oil on board (16″ x 20″), sold at Whyte’s – 17/7/2017 for €320.00. 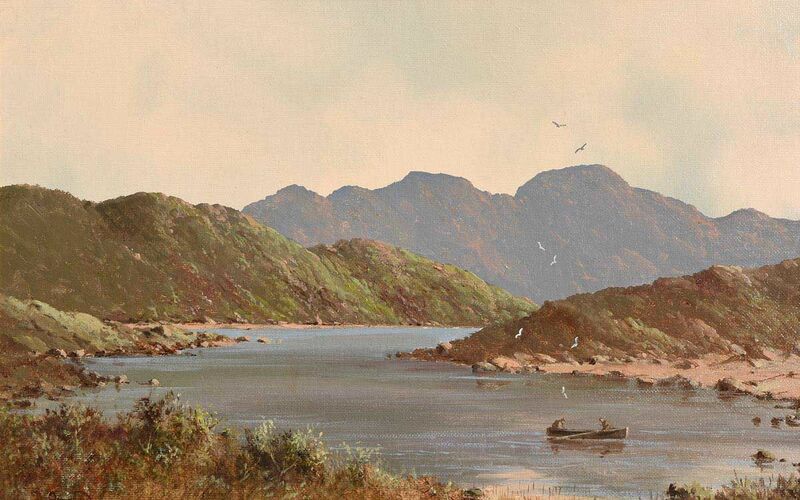 “Fossa Shore, Lough Leine, Killarney” oil on canvas (20″ x 24″), sold at Adam’s – 13/12/2016 for €200.00. 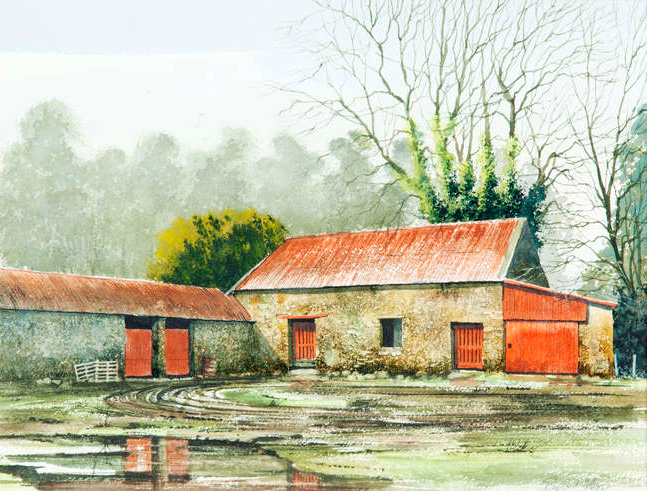 “Old Cottages, Caragh” watercolour (11″ x 15″), sold at Morgan O’Driscoll’s – 15/5/2017 for €260.00. 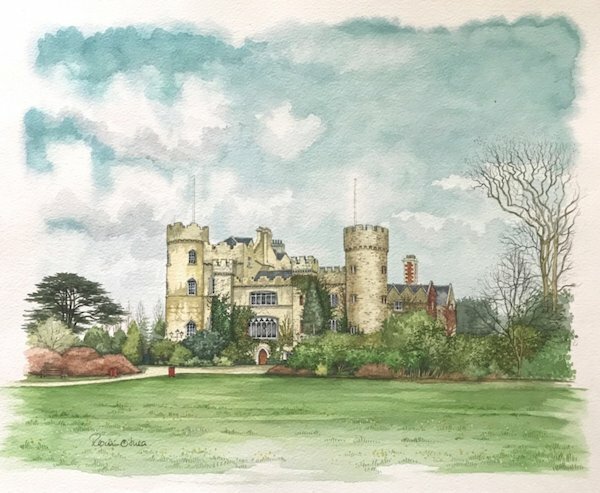 “The 18th Green, Killarney” watercolour (10.5″ x 14.5″), sold at Mullock’s (Shropshire), UK – 24/5/2018 for £120.00. “The Future’s Here to Stay” acrylic on canvas. 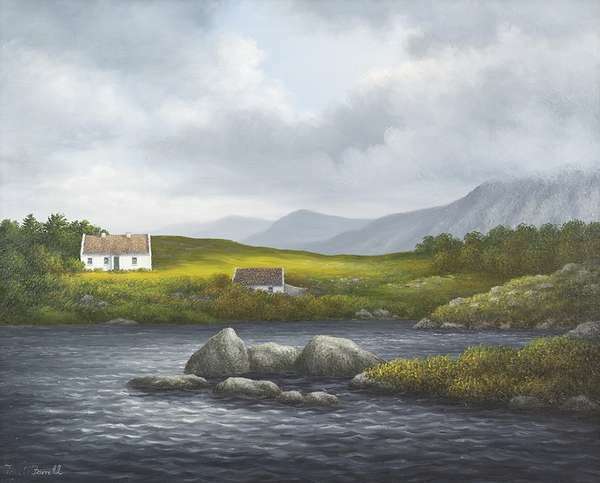 Born in Ennis, Co. Clare, Mick O’Dea studied at the National College of Art & Design, Dublin and the University of Massachusetts, Boston from 1976 to 1981. In 1997, he received an M.A. 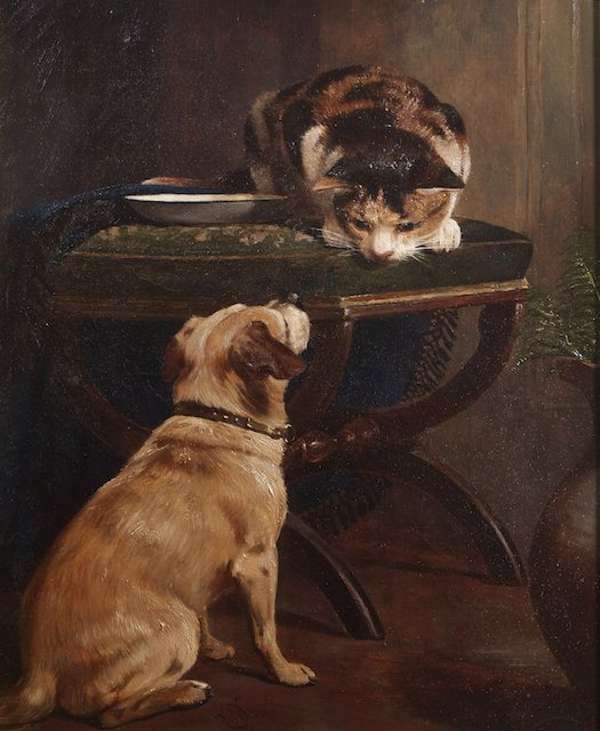 in European Fine Art from the Winchester School of Art in Barcelona and Winchester. 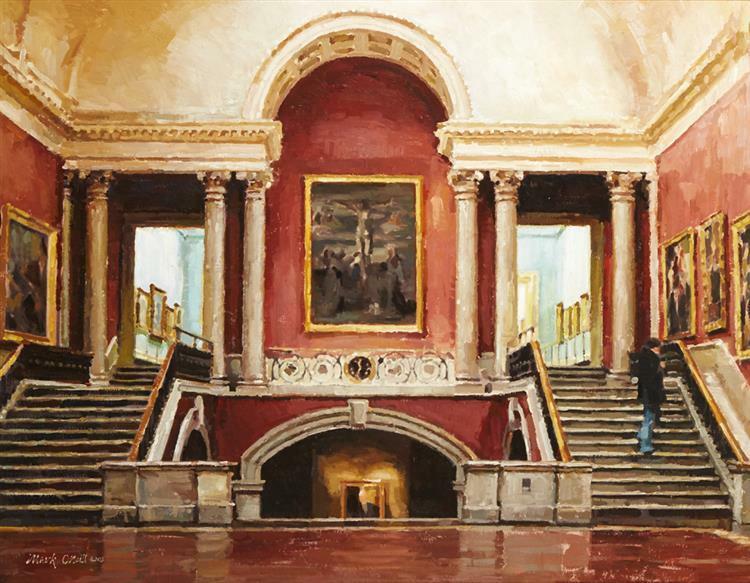 He taught at NCAD from 1981 to 1999, and has also taught at universities in England and the U.S.
Mick O’Dea was elected a Member of the Royal Hibernian Academy in 1996 and was elected President of the Royal Hibernian Academy in 2014. 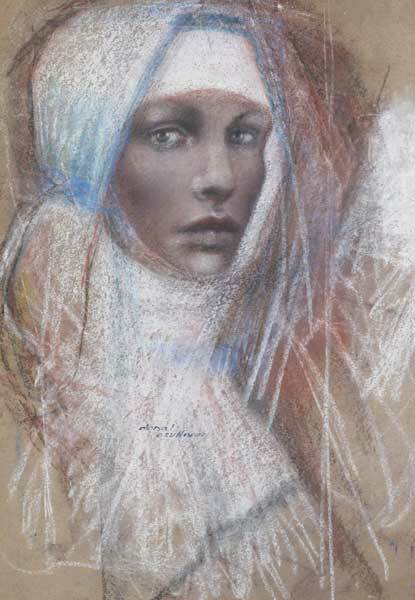 “Portrait of Monica Owens” dated 1986, pastel (22″ x 15″), unsold at Whyte’s – 17/7/2017. 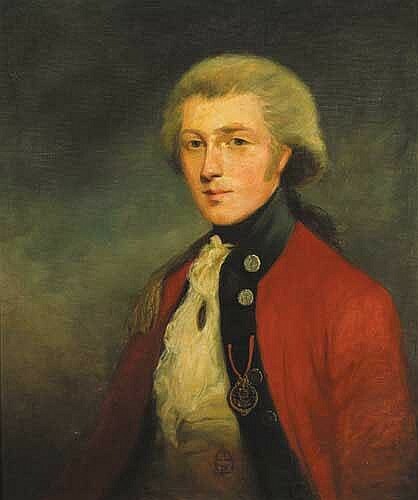 Portrait of an officer of the 4th King’s Own Regiment of Foot – copied from an earlier work, oil on canvas (31″ x 26″). 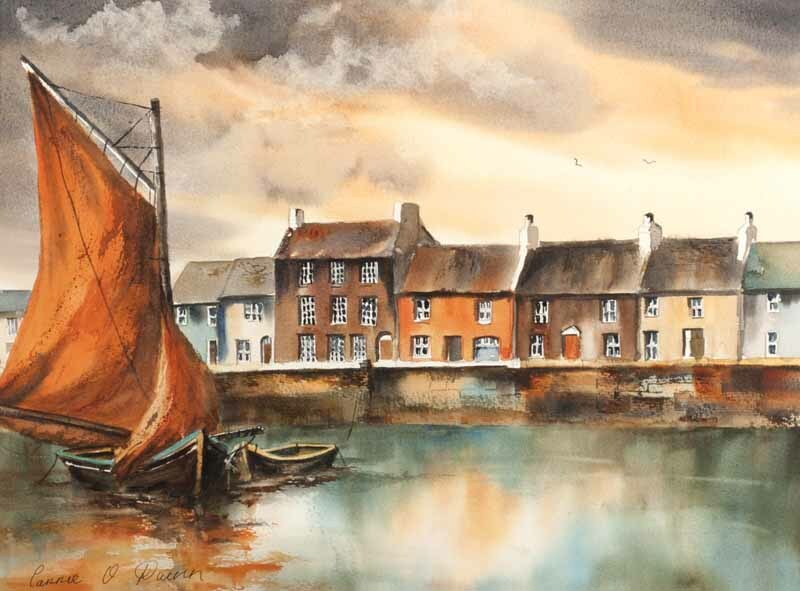 “Ardmore” oil on board (13″ x 14″), sold at Whyte’s – 24/9/2014 for €400.00. “Glencar, Kerry” oil on board (13″ x 16″) sold on eBay in November 2016. 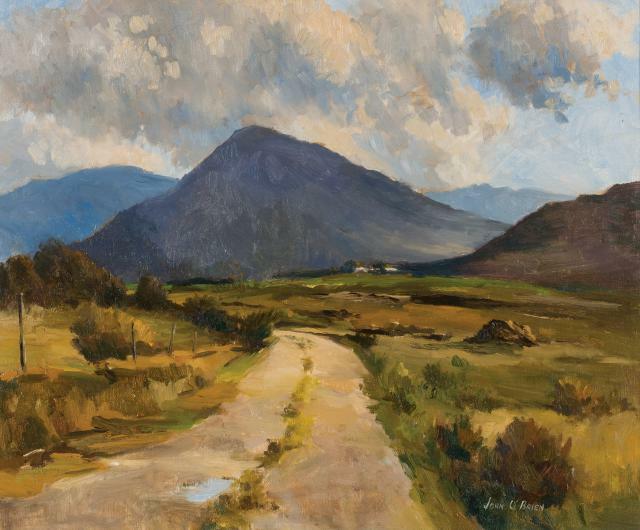 “Connemara Light” oil on board (15.5″ x 19.5″), sold at Morgan O’Driscoll’s – 2/10/2018 for €380.00. 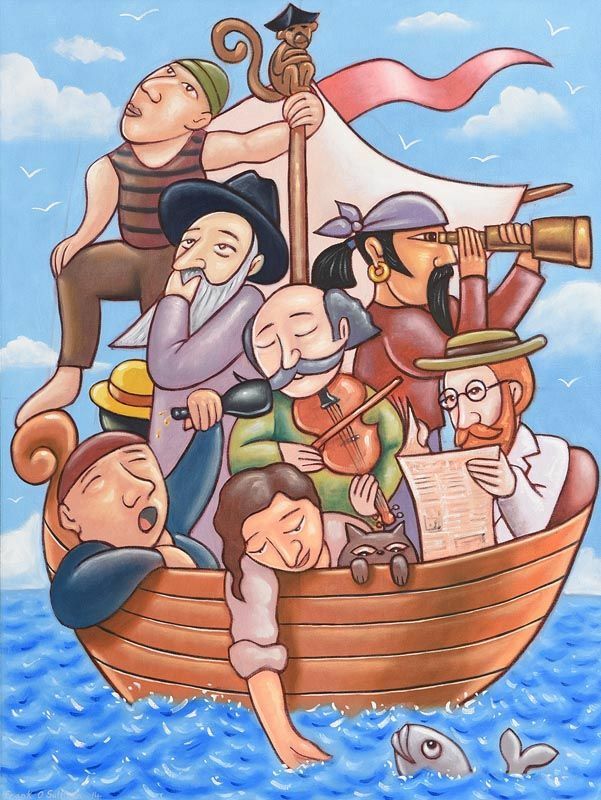 Dublin based Artist and Illustrator. “Killarney Lake” acrylic on board. 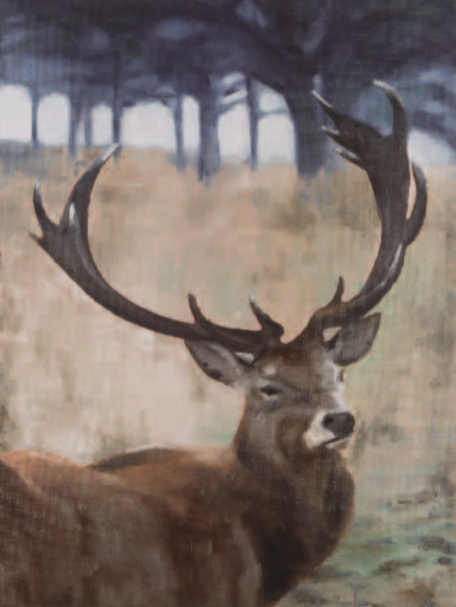 “Caherdaniel” oil on board (7″ x 9.5″). Left to right: “Still Life with Flowers” oil on board (17″ x 13″), unsold at Whyte’s – 17/7/2017; and “Lake and Mountain Landscape” oil on canvas, unsold at Herman & Wilkinson 2/5/2018. “Seaside Cottage” oil on board (14″ x 18″), sold at Fonsie Mealy’s – 10/7/2018 for €240.00. 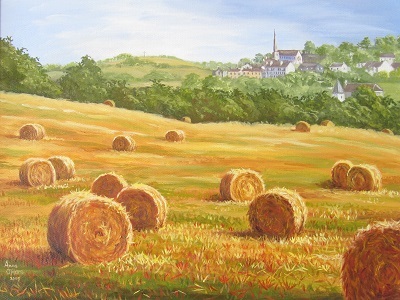 “Aftermath, West Clare” dated 2007. Oil on board (15″ x 21″). 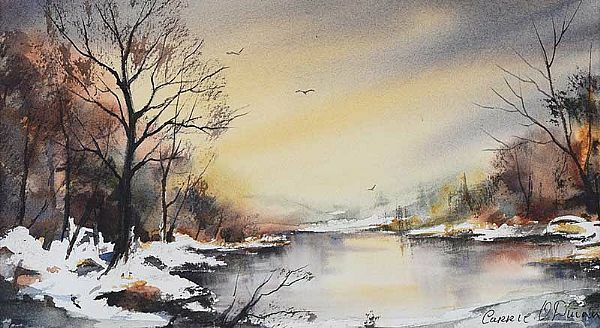 Born in Ireland and studied at the National College of Art & Design in Dublin. 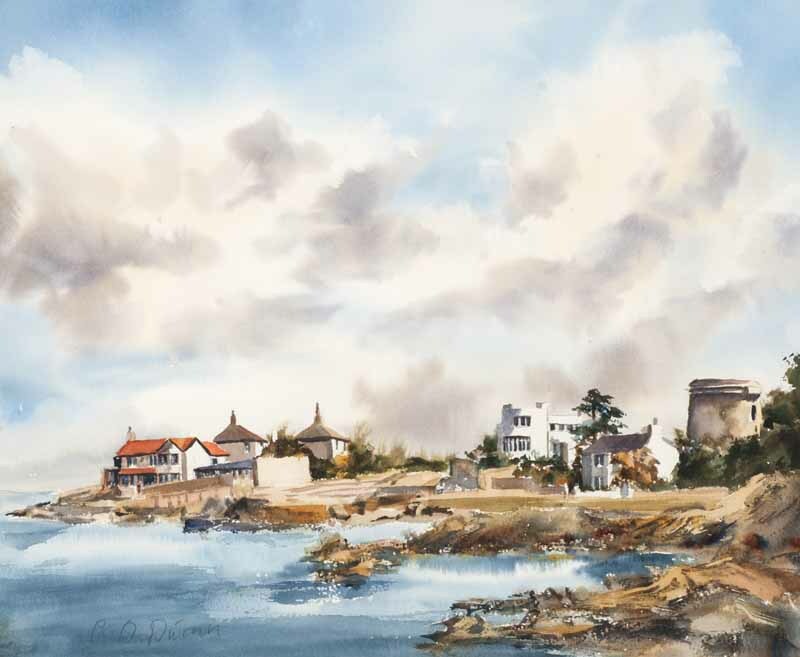 “Sandycove” watercolour drawing (18″ x 21″). 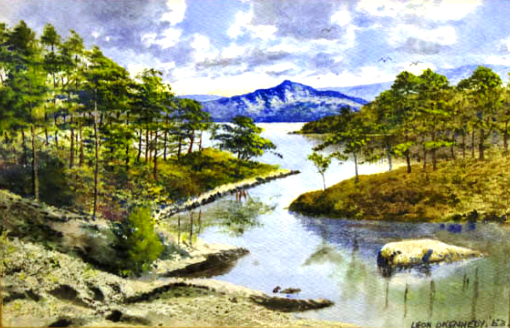 Left to right: “Sheltered Harbour” watercolour (15″ x 20″); and “Winter Lough” watercolour drawing (7″ x 12″), unsold at Ross’s – 21/3/2018. 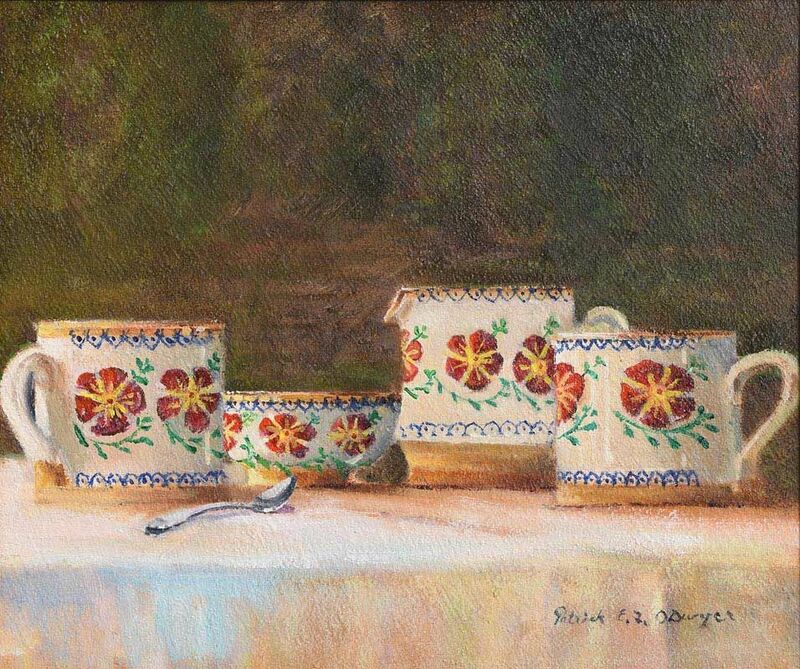 “Morning Coffee” oil on board (10″ x 12″), sold at Morgan O’Driscoll’s – 3/10/2016 for €240.00. 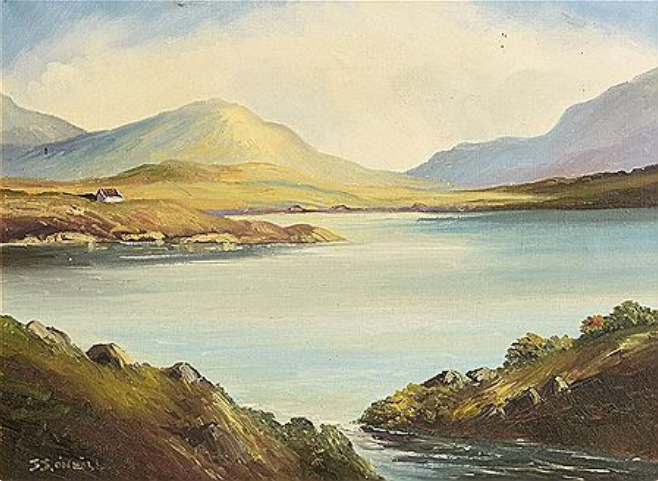 “West of Ireland Lake & Mountain Scene” oil on canvas (23″ x 30″), sold at Adams – 16/12/2014 for €150.00. 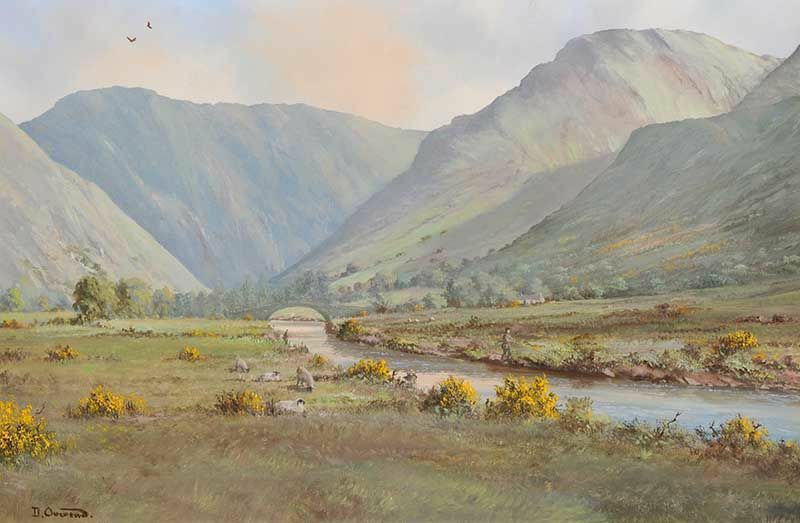 Anthony O’Hagan is a self-taught artist based in Maghera, County Derry. 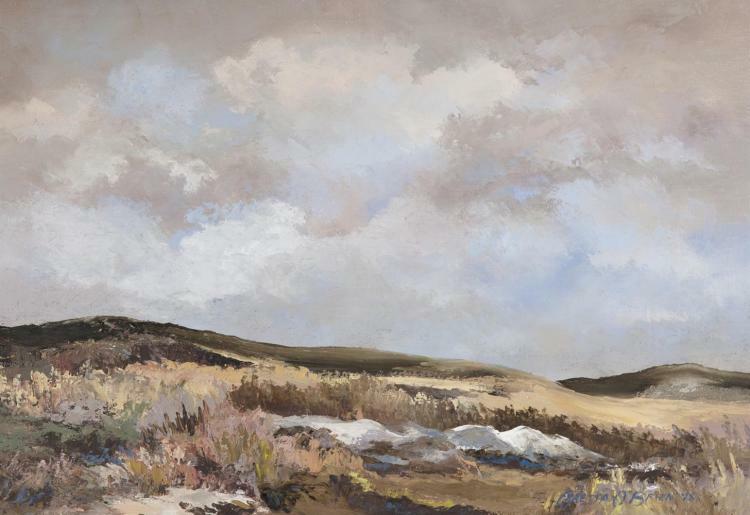 He is known for his contemporary landscapes with vivid red skies and signature quirky sheep. 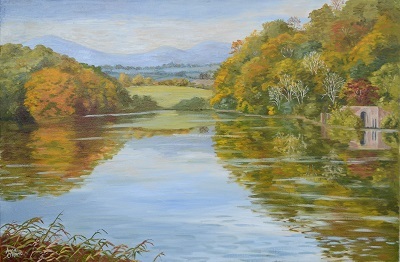 Left to right: “Rolling towards Crosshaven” oil on canvas (13.5″ x 17.5″); and “Blackwater Reflections” oil on canvas (19.5″ x 29.5″). 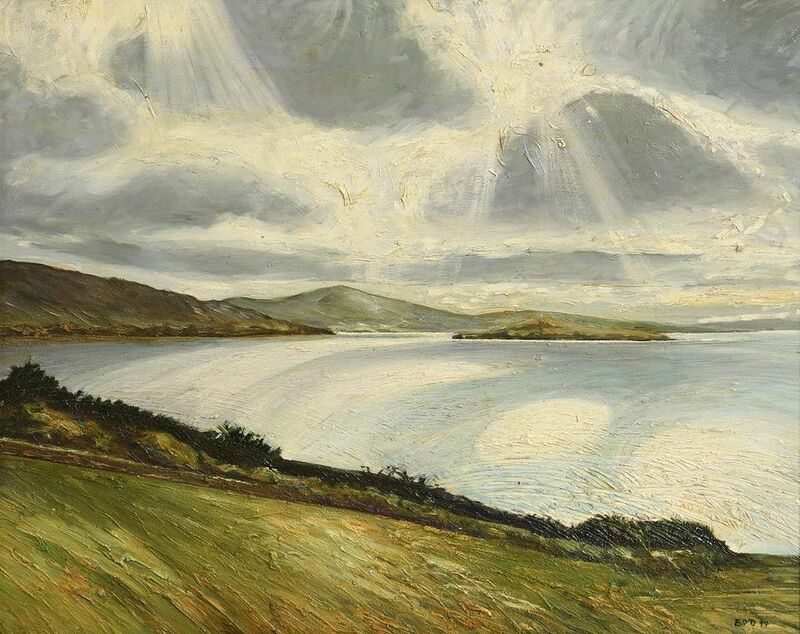 “Connemara Landscape” dated 2005, oil on board (9″ x 24″). 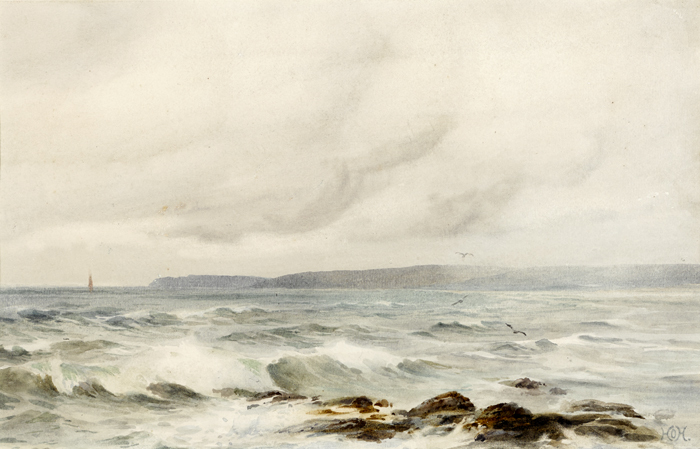 “Coastal Scene” watercolour (8″ x 13″), sold at Whyte’s – 10/12/2016 for €400.00. 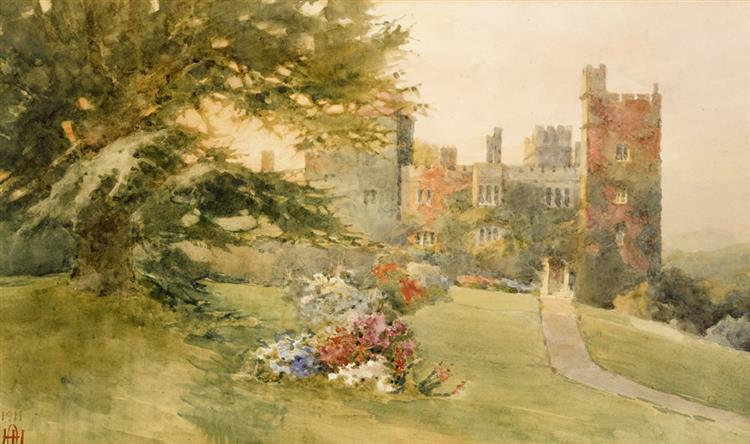 “Lismore Castle” dated 1911, watercolour (12.5″ x 21″), sold at Whyte’s – 2/10/2017 for €1,400. 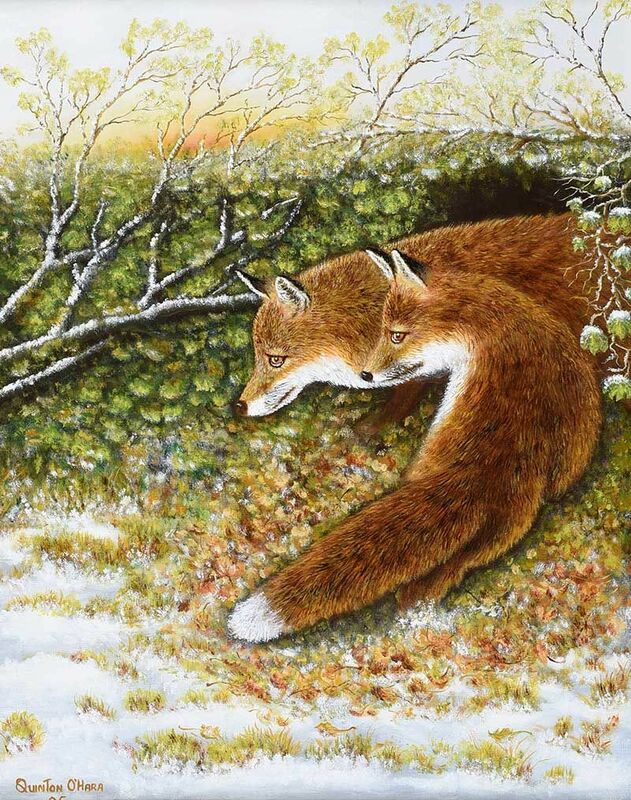 “Fox & Cub” oil on canvas (20″ x 16″), sold at Ross’s – 6/12/2017 for £180.00. “Don Sebastian” (2016) oil on canvas, unsold at Ross’s – 10/8/2016. 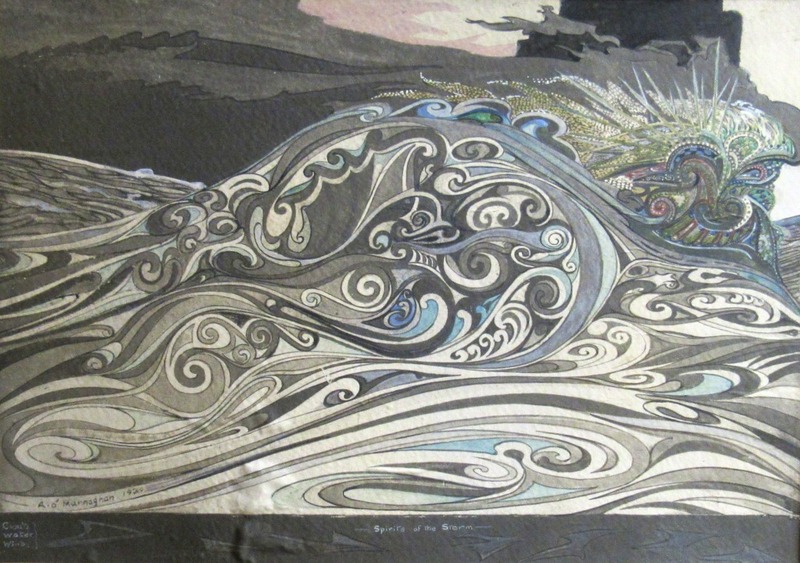 Elizabeth O’Kane is an award-winning sculptor and painter, originally from Northern Ireland, now working in Dublin. Her work follows the realist tradition. 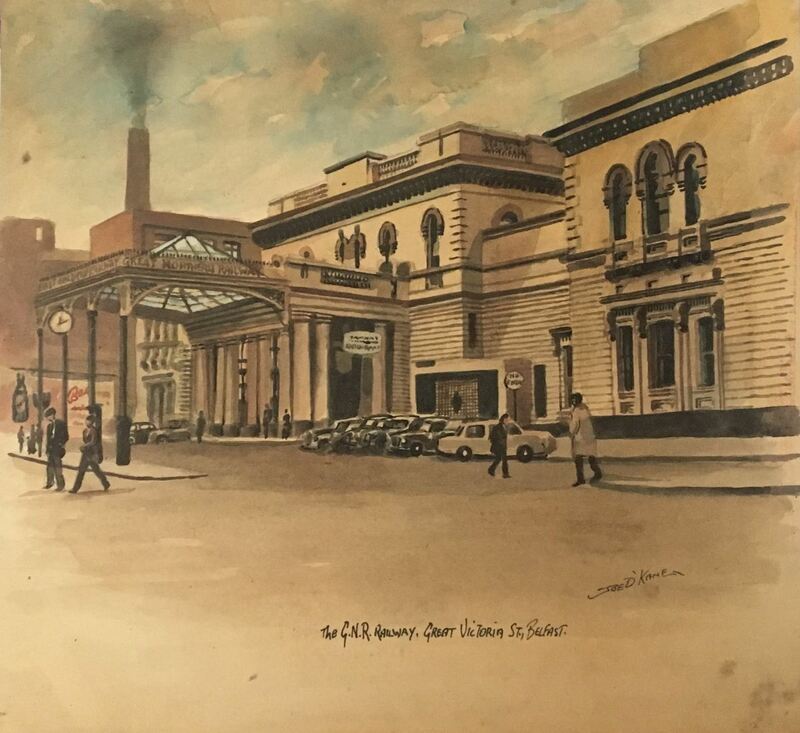 “The G.N.R.Railway, Great Victoria St., Belfast” watercolour drawing (12″ x 16″). 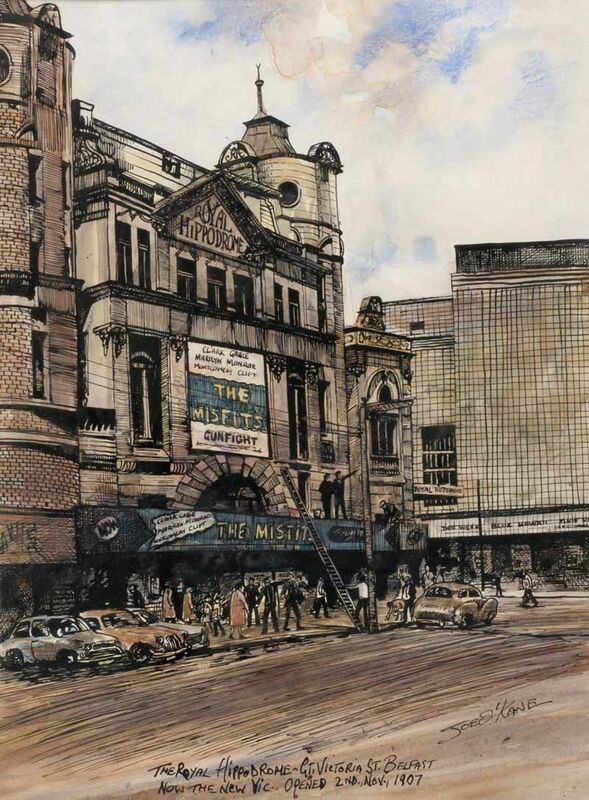 Left to right: “The Royal Hippodrome” pen & ink drawing with watercolour wash (15″ x 11″), sold at Ross’s – 6/2/2013 for £100.00; “The Imperial Cinema” pen & ink drawing with watercolour wash (13″ x 11″), sold at Ross’s – 6/2/2013 for £200.00; and “Barry McGuigan” watercolour drawing (19.5″ x 13.5″), sold at Ross’s – 13/2/2019 for £30.00. Born in Fermoy, Co.Cork of humble parentage, O’Keeffe began painting at an early age and was apprenticed to a coach painter. 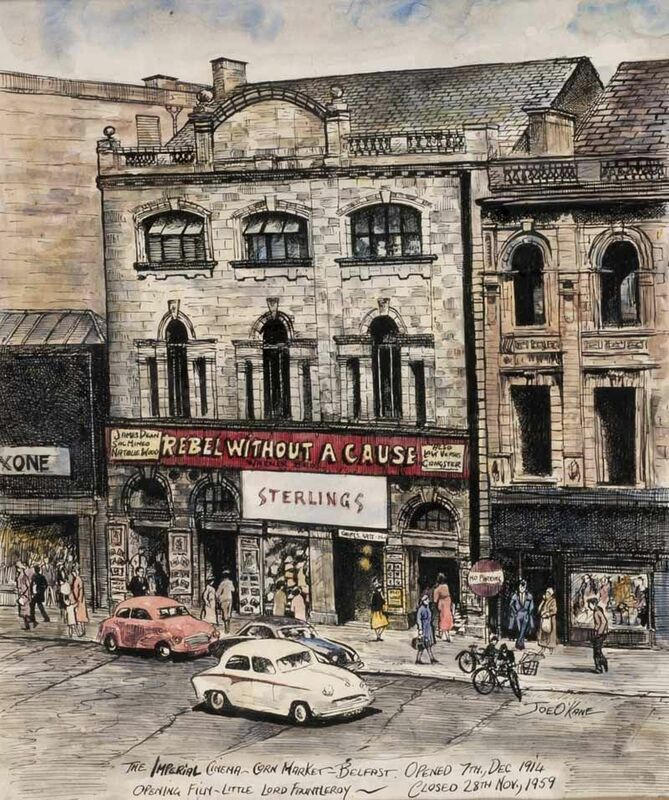 He began painting scenes for local theatres, working his way up to religious pictures for local Roman Catholic churches. 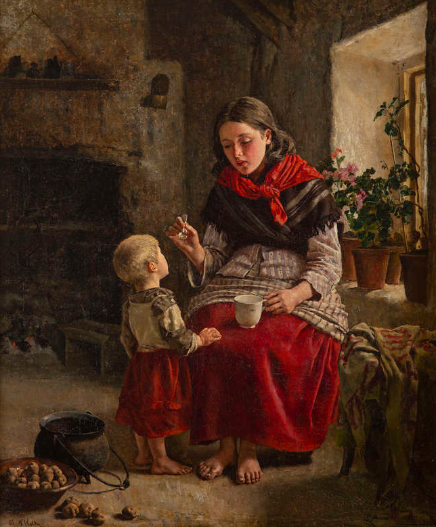 The Irish landscape artist, figurative painter and orientalist Aloysius O’Kelly was born in Dublin. 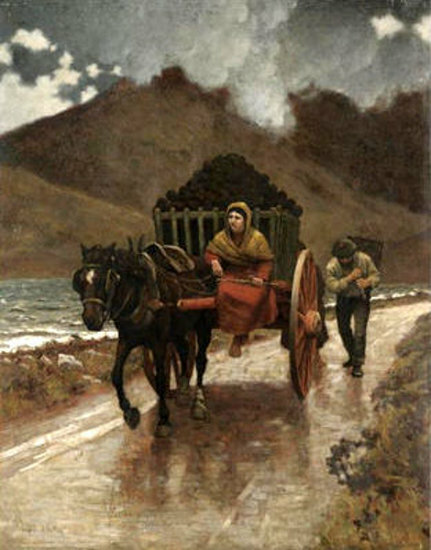 “A Load of Turf, Connemara” oil on canvas sold at Sotheby’s in 2008. 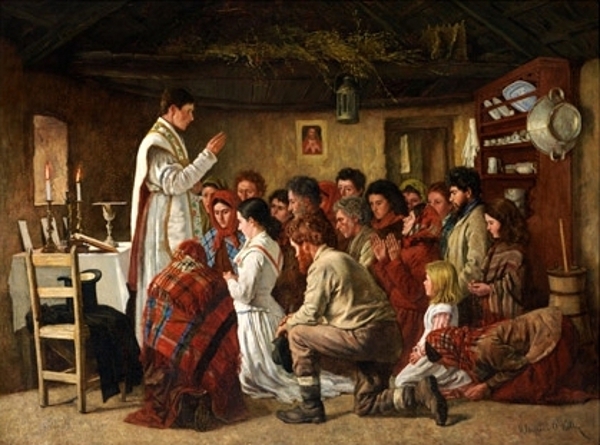 “Mass in a Connemara Cabin” was exhibited in the Paris Salon in 1884 and received much praise but subsequently disappeared for the next 100 years before turning up in a church presbytery in Edinburgh. 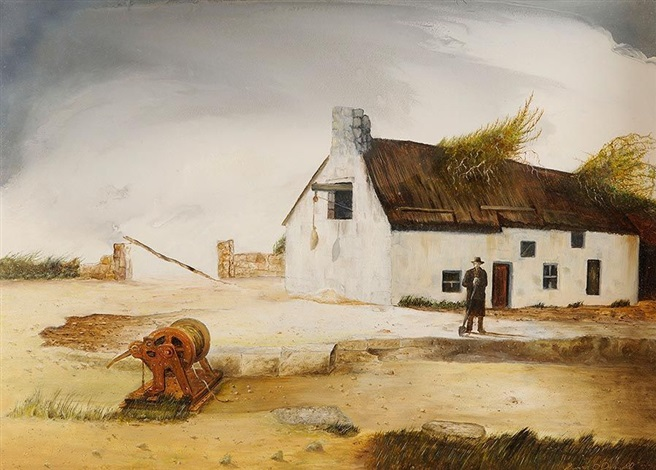 It is now on long-term loan to the National Gallery of Ireland. 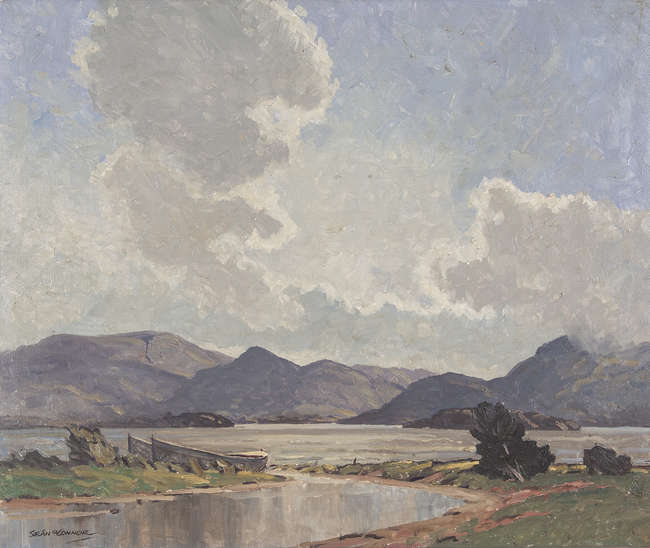 “Expectation, West of Ireland” oil on canvas (29.5″ x 24.5″), exhibited at the RHA in 1881, sold at Adam’s – 27/3/2019 for €40,000. 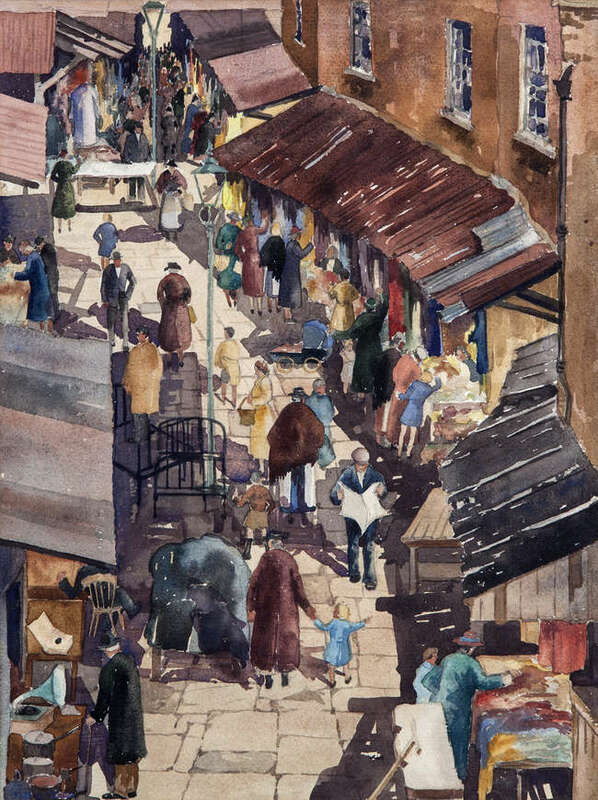 Untitled watercolour (10″ x 16″) sold at Eastbourne Auctions, UK – 21/3/2016 for just £45.00. 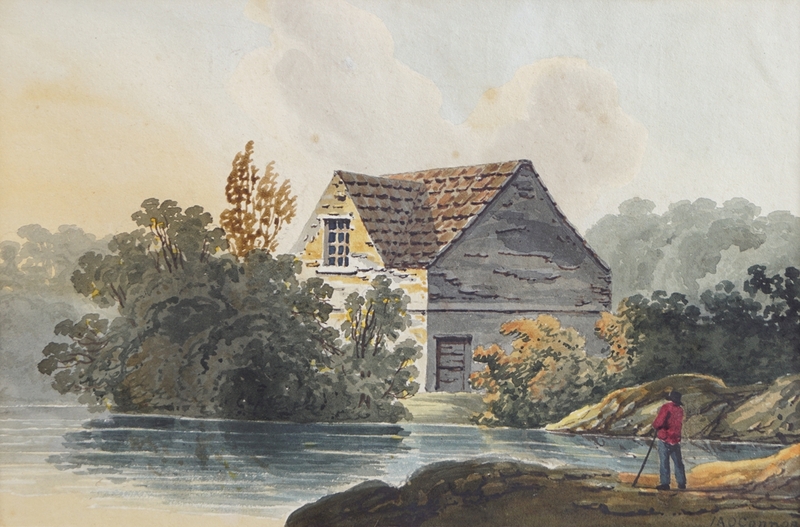 Untitled watercolour sold at Keighery’s, Waterford – 18/9/2017 for €85.00. 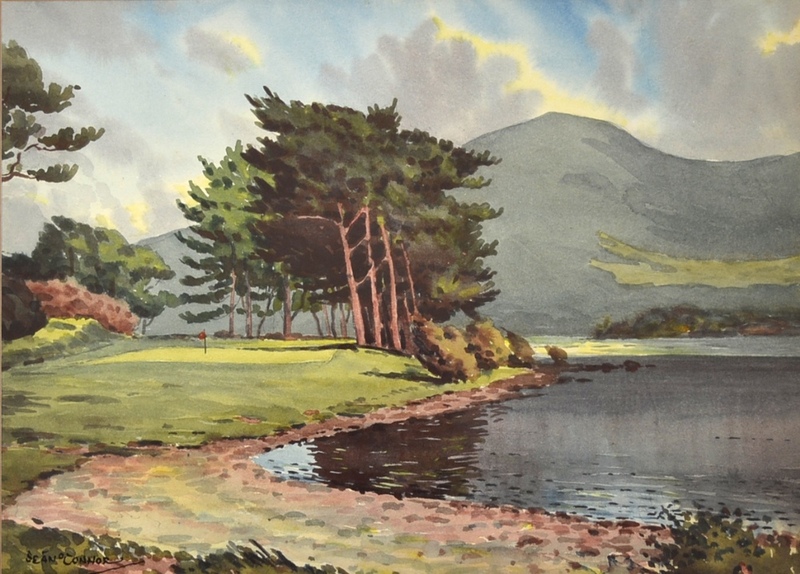 “Parknasilla” watercolour (11″ x 18″), in my collection and purchased after auction from Keighery’s, (Waterford) Oct.2017. Untitled oil on board (11″ x 19″) purchased on eBay in Nov. 2017. 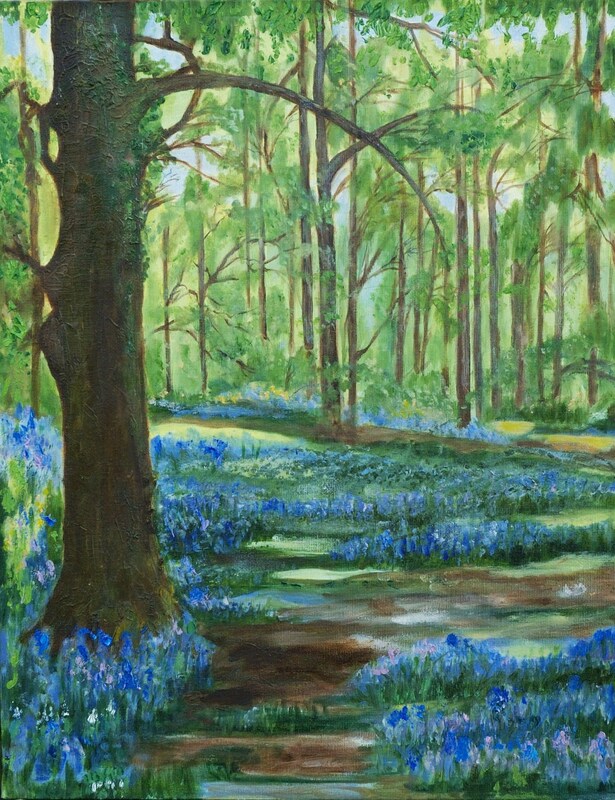 I am a self-taught artist and have been painting for over twenty years. 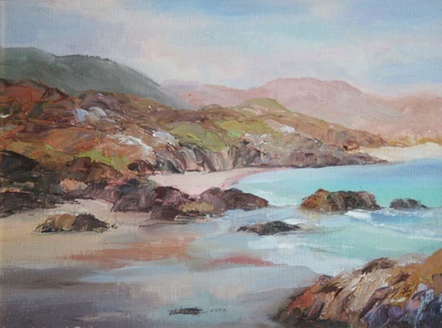 I live in Connemara, a beautiful part of west Galway in Ireland and I am inspired by the beautiful landscapes and the ever-changing light. 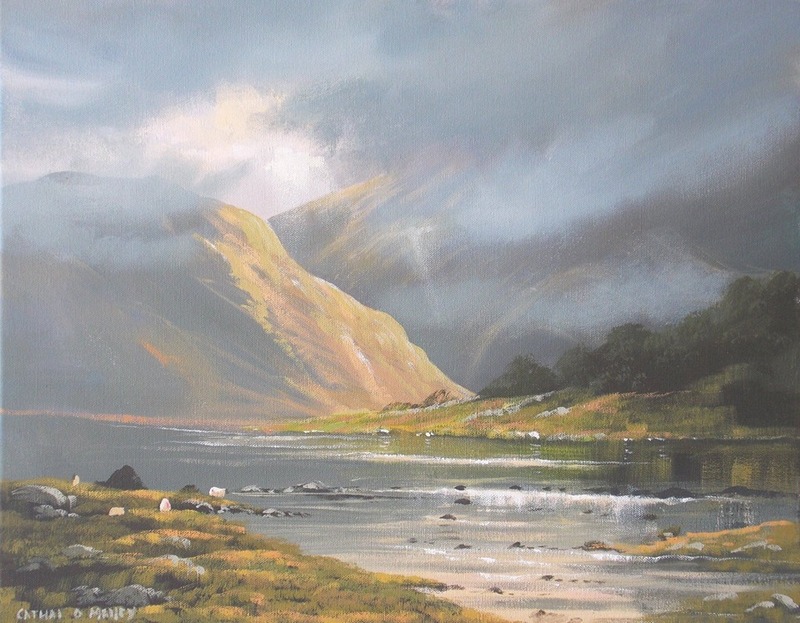 My work has been bought all over the world and more information can be found on my website. 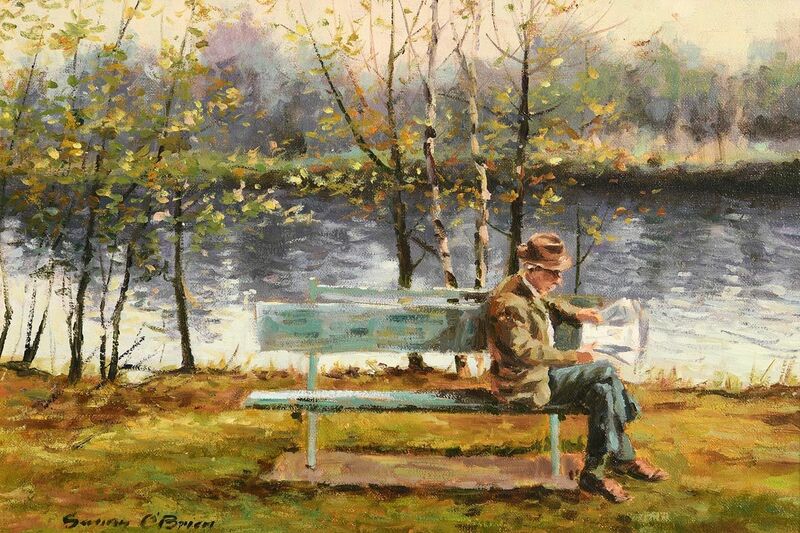 Limerick born, Tomás has been a professional portrait and landscape artist for many years. 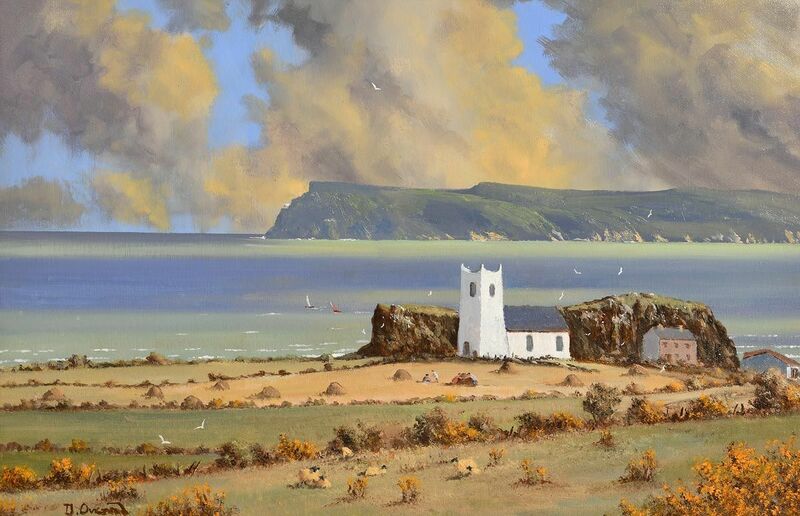 He now lives and works as a full time portrait/figure artist and illustrator in his adopted County Clare. 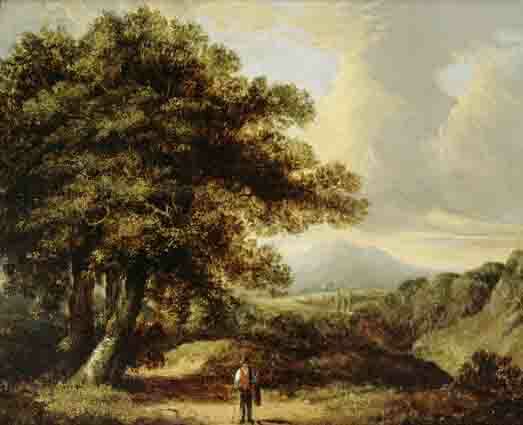 “Autumnal Sorrows” – in the collection of the Ulster Museum. 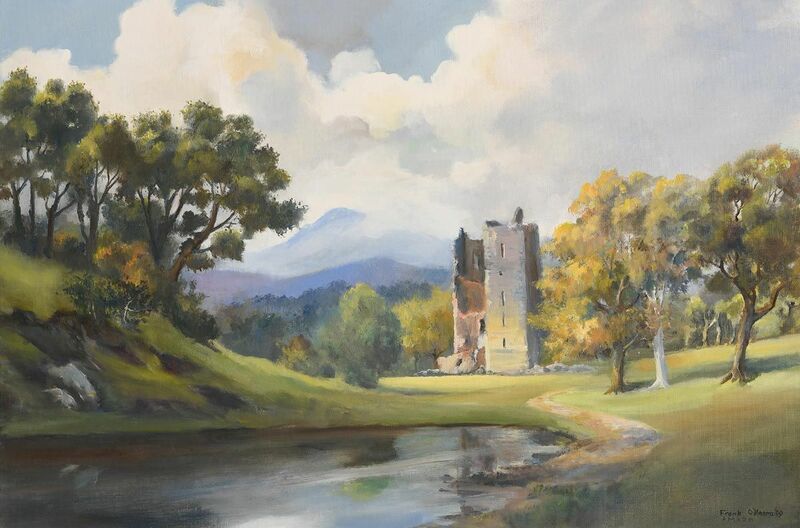 “Norman Ruin in Parkland” dated 1999, oil on canvas board (19.5″ x 29.5″), sold at Morgan O’Driscoll’s – 14/8/2018 for €200.00. “Spirits of the Storm” watercolour (11″ x 17″), sold at Fonsie Mealy’s – 8/3/2017 for €850.00. 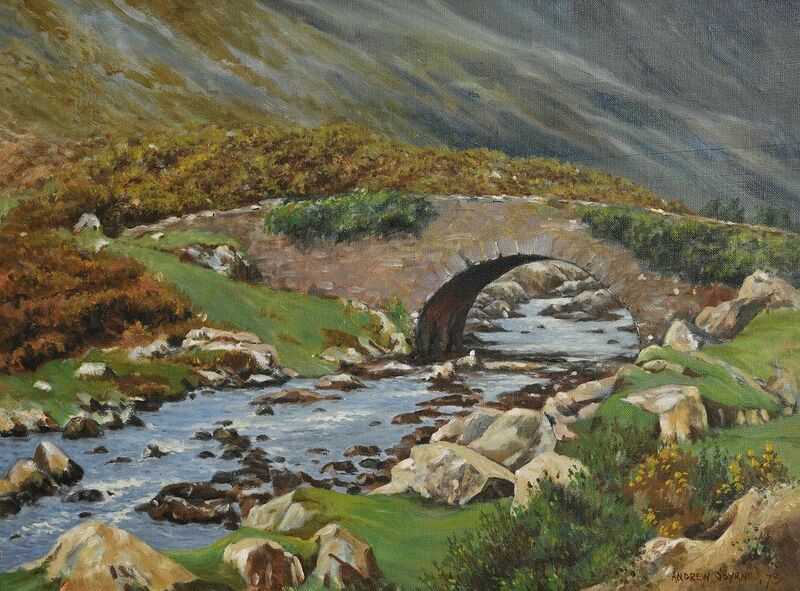 “Gleneely, Co.Donegal” oil on board (15″ x 15.5″), unsold at Adams – 27/3/2019. Born in Clonmel, Co.Tipperary. Archaeologist and painter. 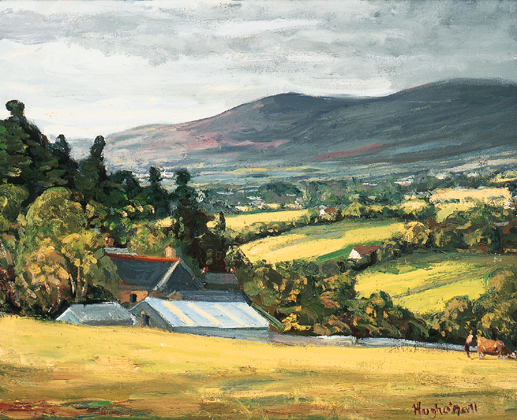 “St.Patrick’s Country, Co.Down” oil on canvas (20″ x 24″). 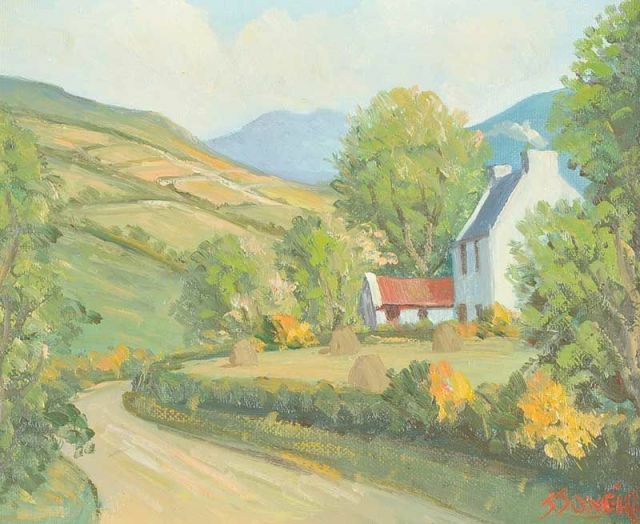 Left to right: “Harvest Time near Connemara” oil on canvas (16″ x 20″) sold at Ross’s 10/8/2016 for £60; “Delphi, Connemara” and “Near Ballycastle, County Antrim” oil on board (8″ x 10″), sold at Ross’s – 1/3/2017 for £30. 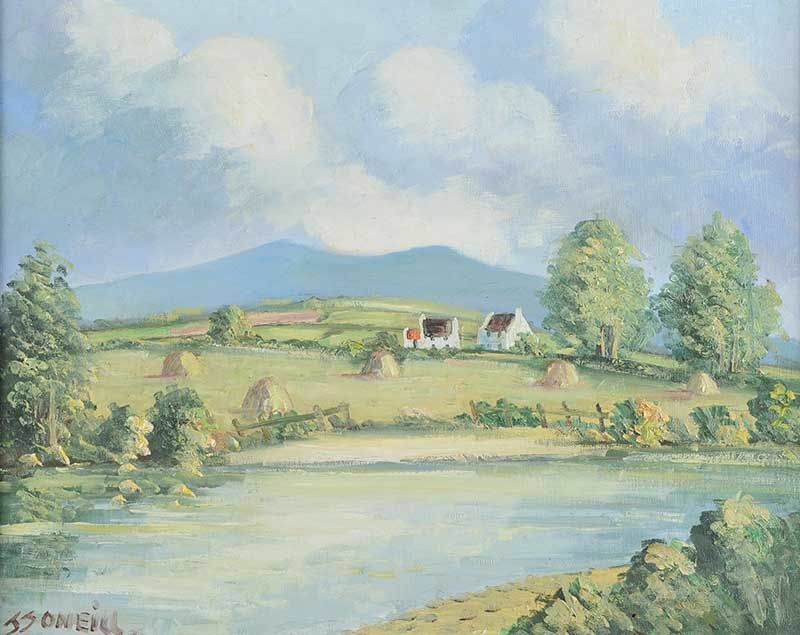 “Summer Time” oil on canvas (16″ x 36″), sold at Morgan O’Driscoll’s – 14/8/2018 for €280.00. 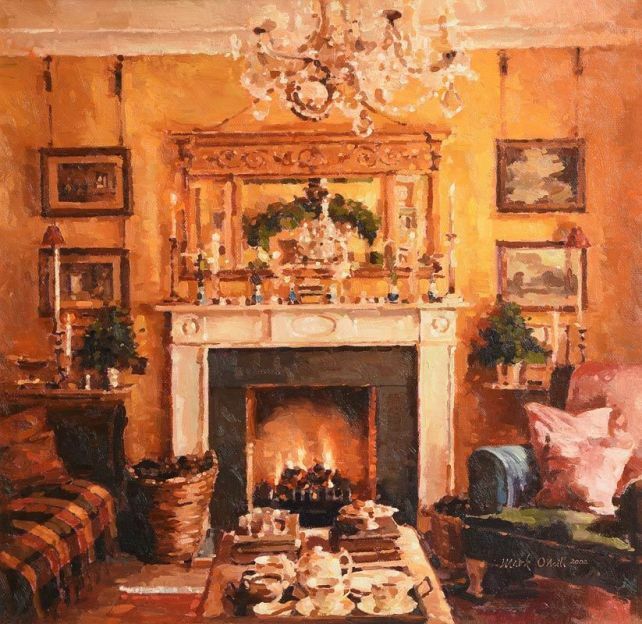 “Festive Drawing Room” oil on board (23″ x 23″), unsold at Morgan O’Driscoll’s – 24/10/2016. Left to right: “Galvanised Red” oil on board (17″ x 22″), sold at Adam’s – 28/9/2016 for €4,400.00; and “The National Gallery, Dublin” 2003, oil on board (22″ x 28″), sold at Whyte’s – 2/10/2017 for €7,500. 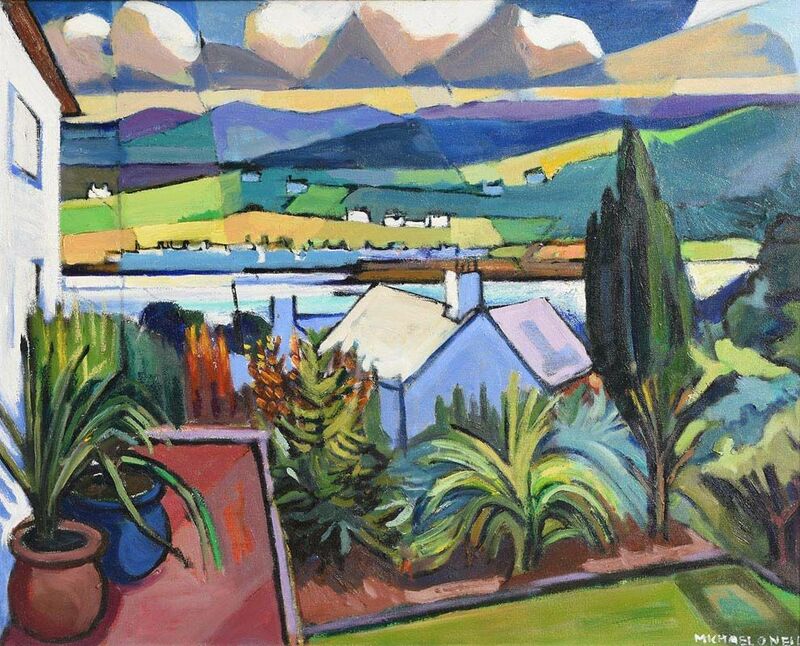 “Donegal Landscape” oil on canvas (23″ x 29″), sold at Morgan O’Driscoll’s – 23/1/2017 for €460.00. “Cherry Blossoms” oil on canvas (9″ x 13″), sold at Whyte’s – 10/12/2016 for €480.00. 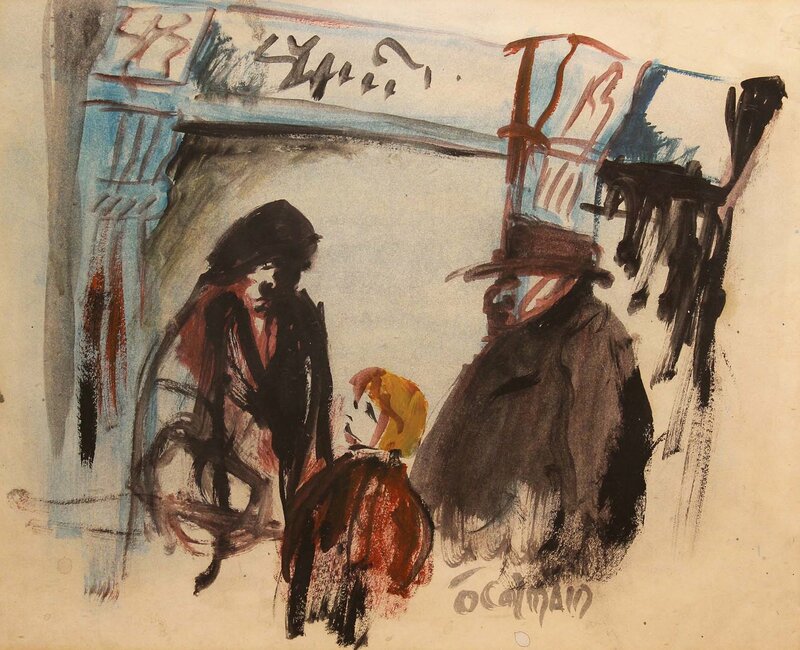 Left to right: “Brian O’Nuallain aka Flann O’Brien” oil on canvas (31″ x 25″), sold at Fonsie Mealy’s – 7/3/2018 for €950.00; and “Tom Murphy” poet and playwright, charcoal drawing (19.5″ x 15.5″), sold at Fonsie Mealy’s – 7/3/2018 for €380.00. 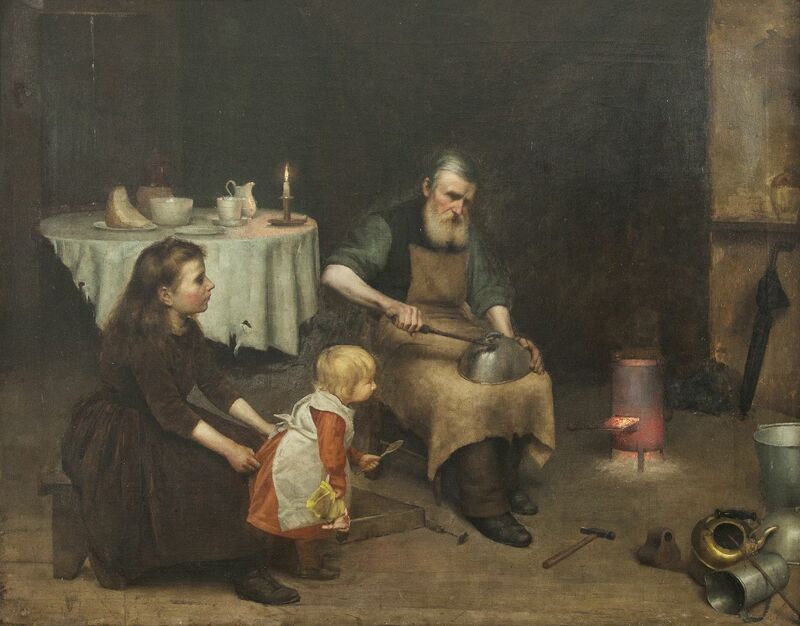 “A Tinsmith at Work” oil on canvas (43.5″ x 56″) sold at Adams – 2/12/2015 for €10,000.00. Belfast born wood engraver and painter. 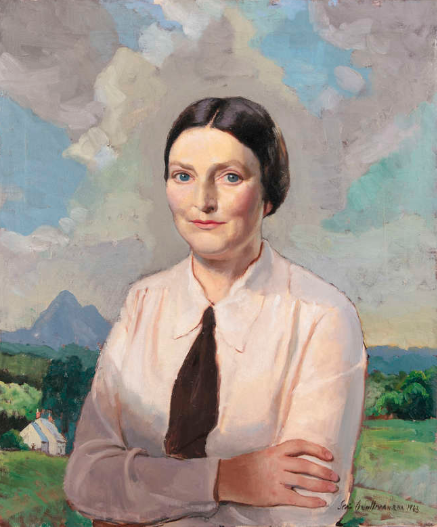 Born in Carrickmines, County Dublin, Bea Orpen was a landscape and portrait painter. 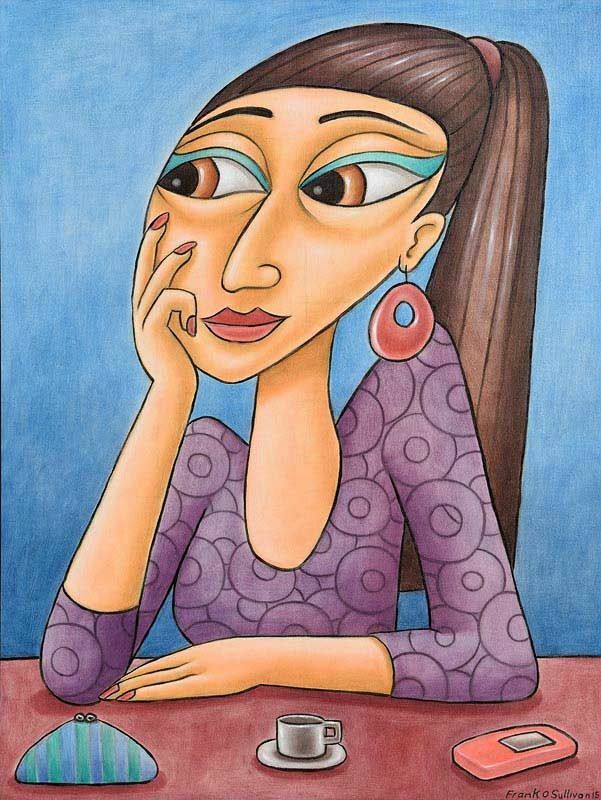 She studied at the Metropolitan School of Art, Dublin before becoming an Art Teacher. 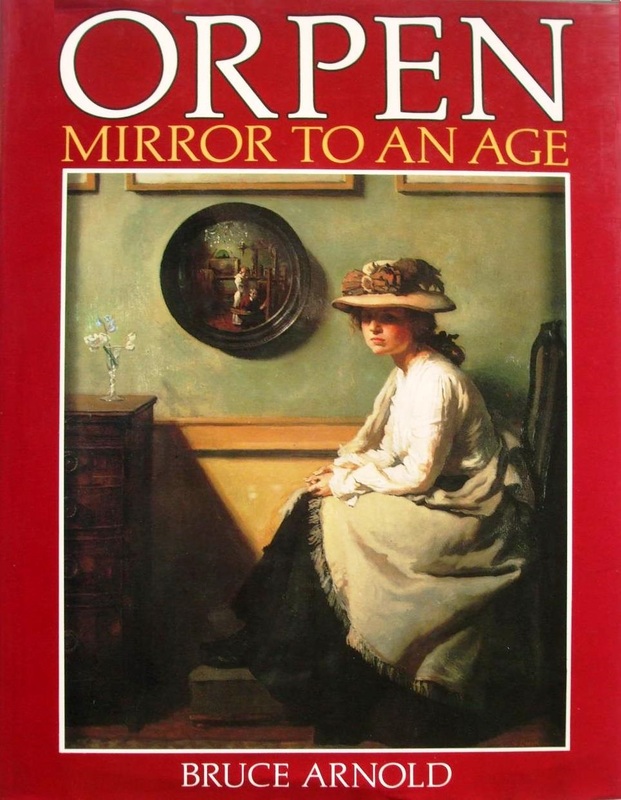 The niece of Sir William Orpen, she played an instrumental role in establishing Drogheda Municipal Gallery of Art. 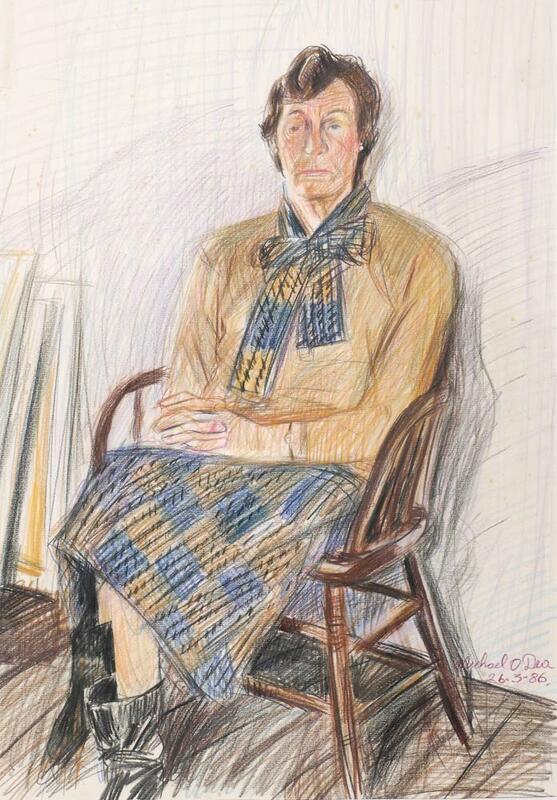 She was made an honorary member of the RHA in 1980. 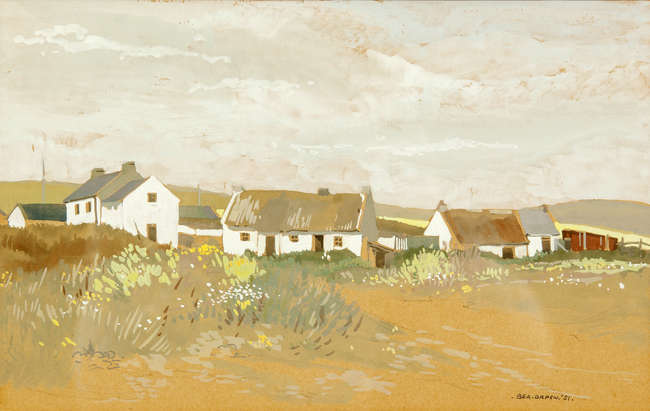 “Cottages at Clogher” watercolour sold at James Adams 1/6/16 – €700.00. Left to right: “Mayo Sky” gouache on paper (9″ x 12″), sold at Morgan O’Driscoll’s – 3/10/2016 for €260.00; and an untitled seascape, gouache on paper (14″ x 19.5″) sold on eBay – 6/2/2017 for £120.00. 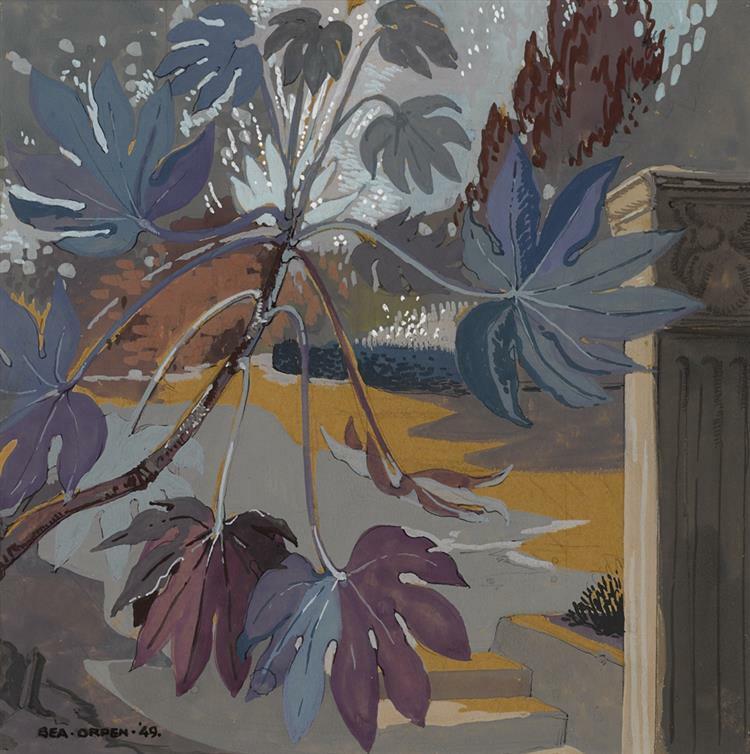 “In an Ipswich Garden” dated 1949, gouache on buff coloured paper (9″ x 9″), sold at Whyte’s – 3/4/2017 for €700.00. 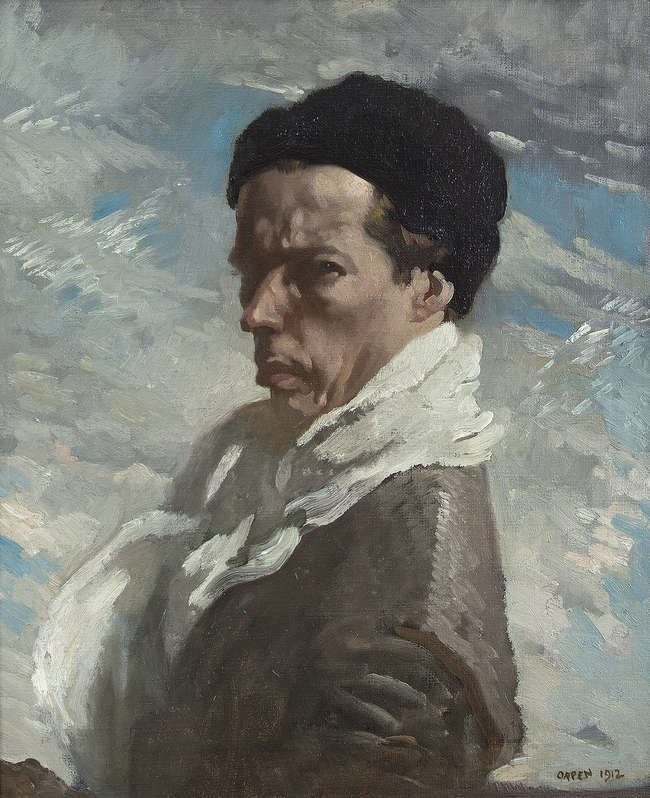 An architect and painter, and the elder brother of William Orpen (1878–1931). 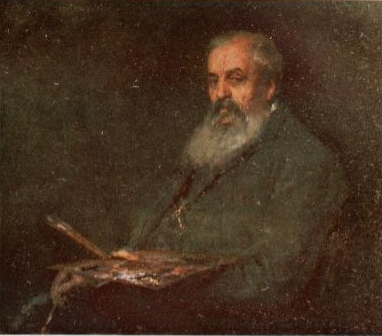 He exhibited at the Royal Hibernian Academy from 1888 and showed works every year from 1906-36. 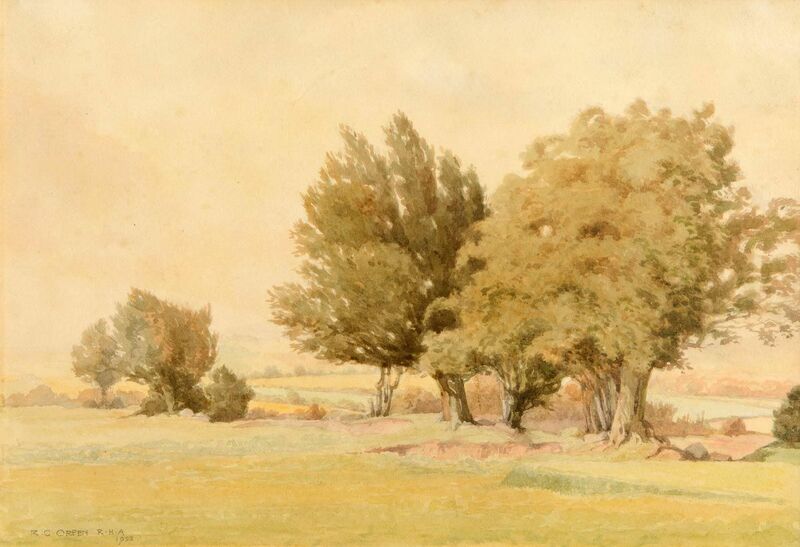 “September Morning: Carrickmines Golf Links” watercolour (9″ x 13″), sold at Morgan O’Driscoll’s – 2/12/2013 for €700.00. 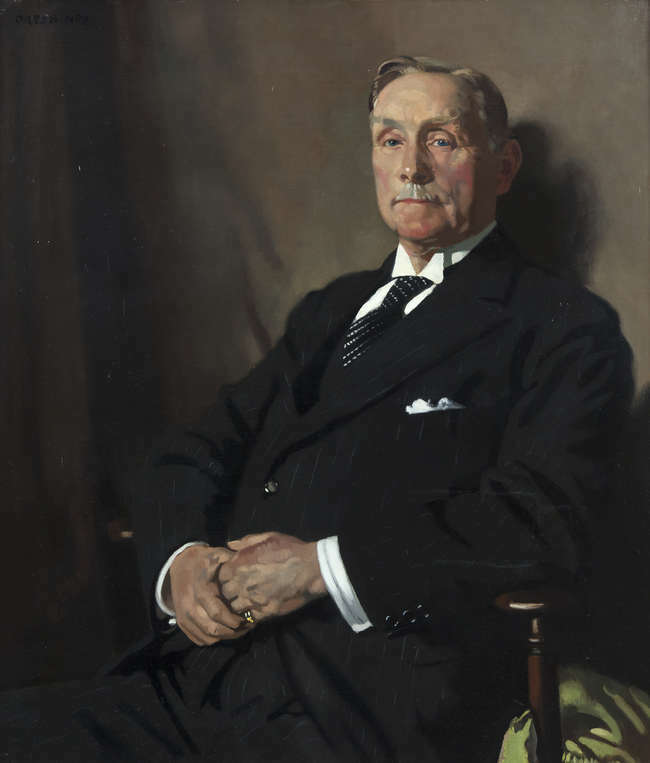 Left to right: Portrait of Sir Robert Williams – oil on canvas (40¼” x 33¾”) sold at James Adams 1/6/16 – €8,000. 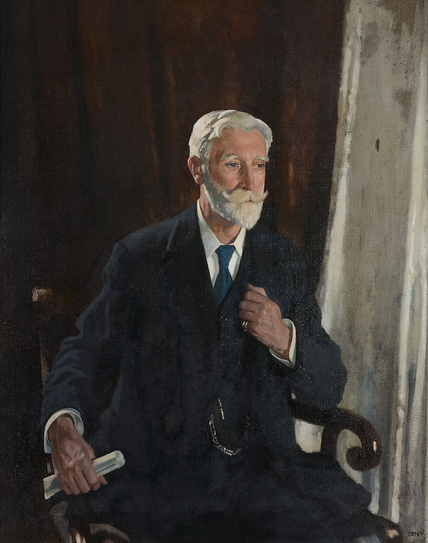 Portrait of William Martin Murphy – oil on canvas (50″ x 40″) sold at Dreweatts & Bloomsbury (Donnington Priory, Newbury, England) 6/4/2016 – £39,000 and Self-Portrait (1912) oil on canvas (24″ x 20″), sold at Adam’s – 7/12/2016 for €110,000. 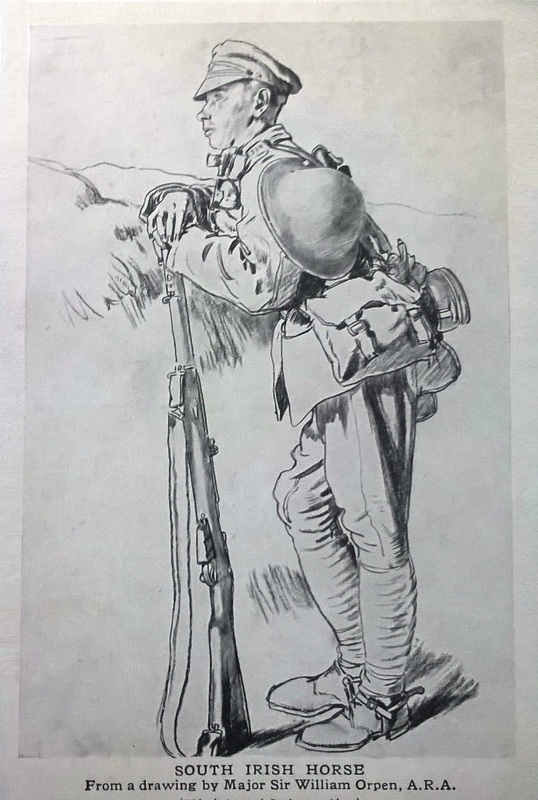 A postcard featuring a soldier of the South Irish Horse from a drawing by Major Sir William Orpen A.R.A. (Ministry of Information). 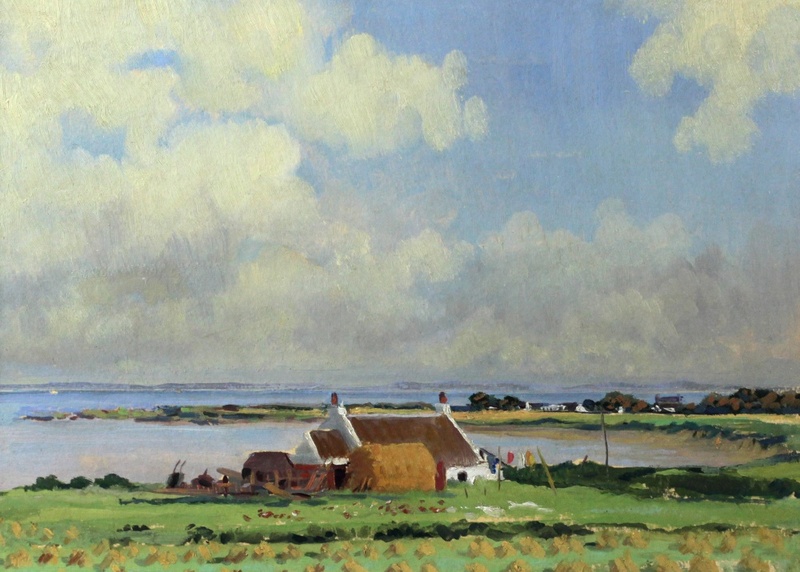 Orpen was already a much-acclaimed artist by the time he joined the Army as a 2nd Lieutenant in 1916. 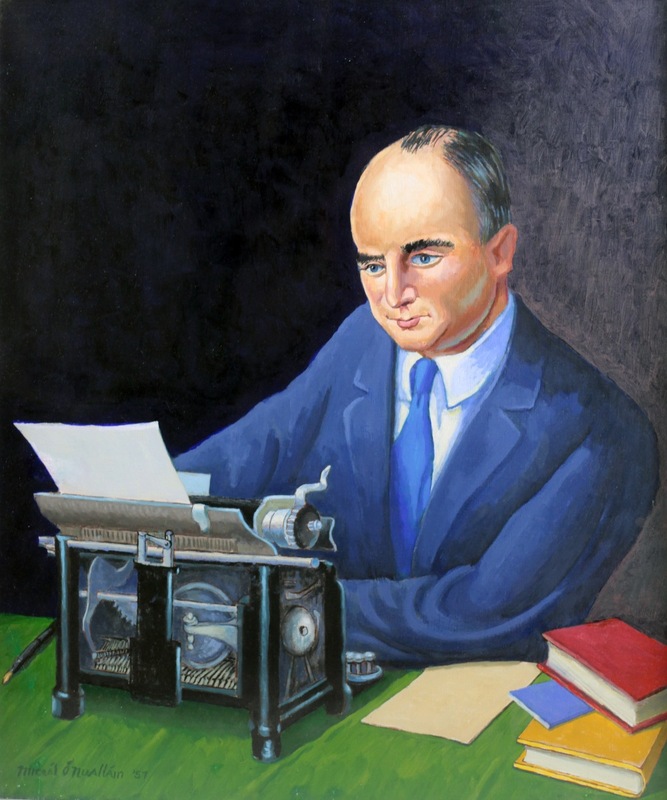 He was soon promoted to Major, and when the Department of Information offered him the chance to work in France for three weeks ‑ he took it and stayed for three years. Published by Jonathan Cape (1982), hardback, 448 pp with many illustrations. 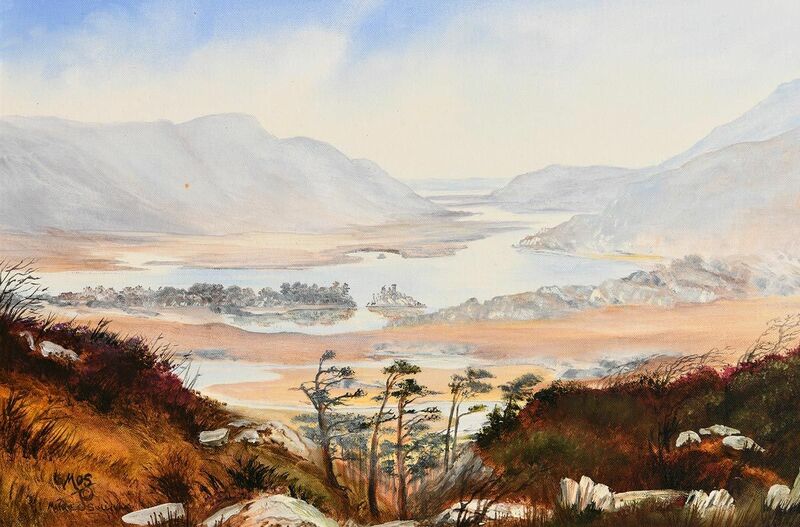 Left to right: “Near Clifden, Connemara” oil on canvas (12″ x 22″); and “Dublin Market” watercolour (16″ x 12″), sold at Adam’s – 28/9/2016 for €400.00 and €570.00 respectively. 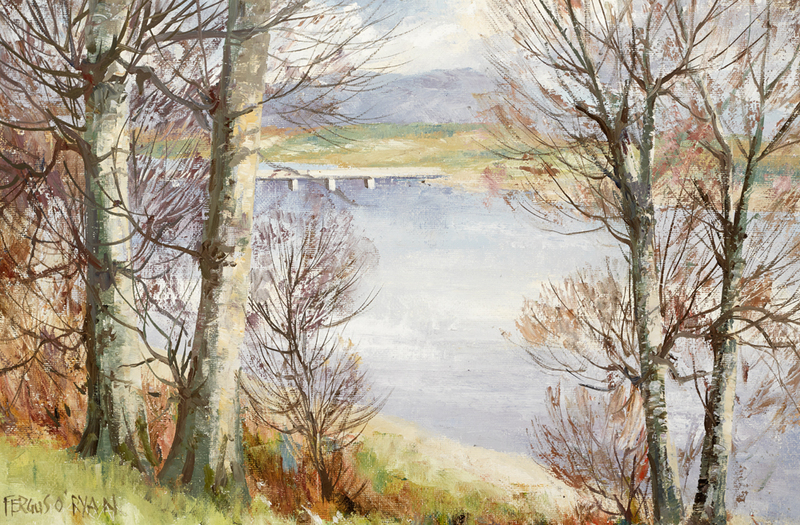 “The Lake at Blessington, County Wicklow” oil on board (15.5″ x 23.5″), unsold at Whyte’s – 23/10/2017. 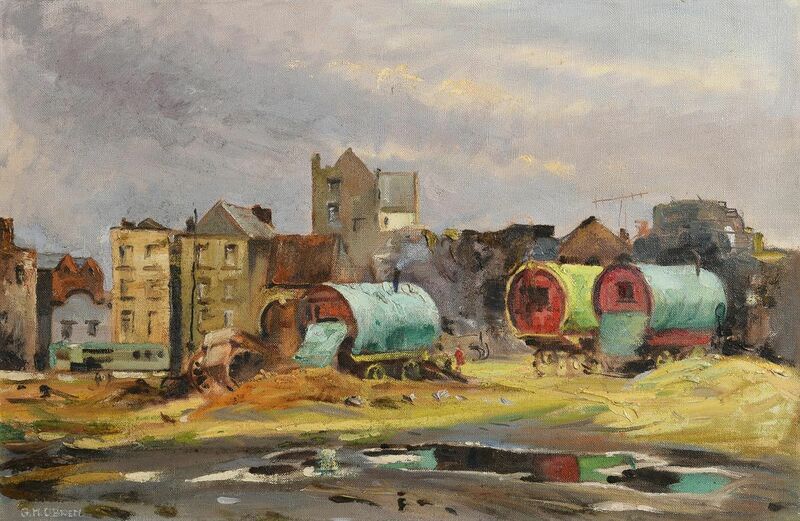 “Ballycorus, Co.Dublin – with the Lead Mines” oil on board (15″ x 17″), sold at Adam’s – 27/9/2017 for €520.00. 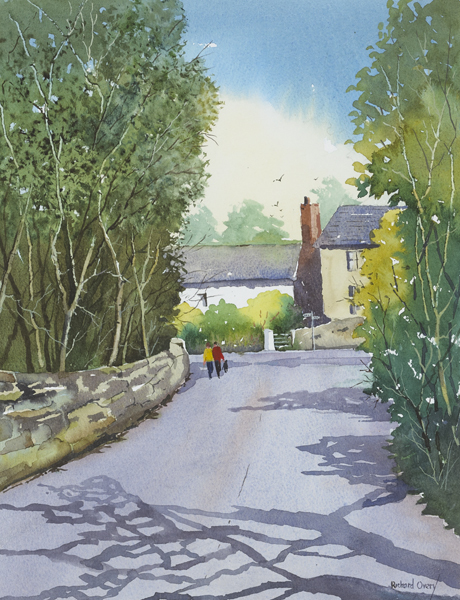 “Old Farm Yard” watercolour (12″ x 16″). 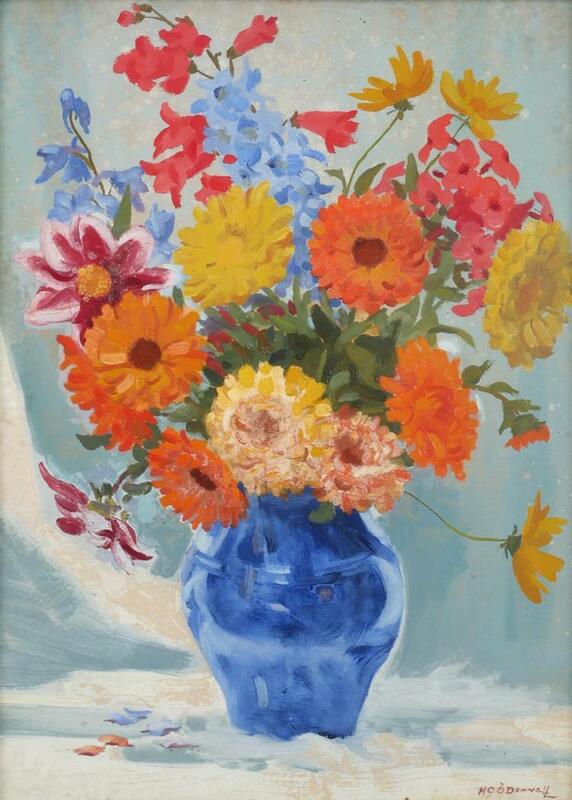 Sold at Adams – 12/6/2016 for €260.00. 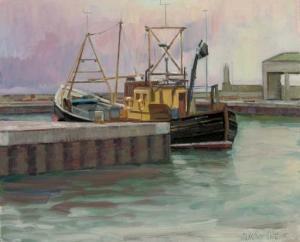 “Saffron Trawler, Portavogie” oil on canvas (20″ x 24″), sold at Ross’s – 27/5/2015 for £360.00. 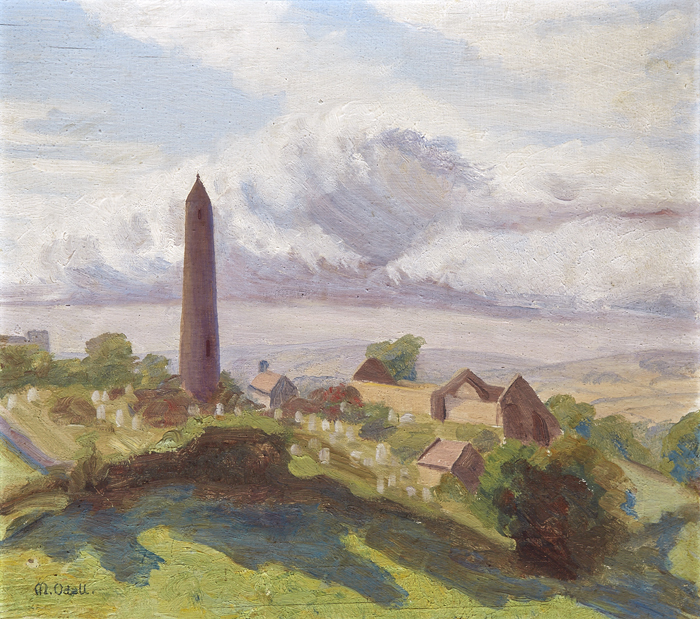 “Nathaniel Hone, RHA” oil painting, from the book Irish Life and Landscape by J Crampton Walker. 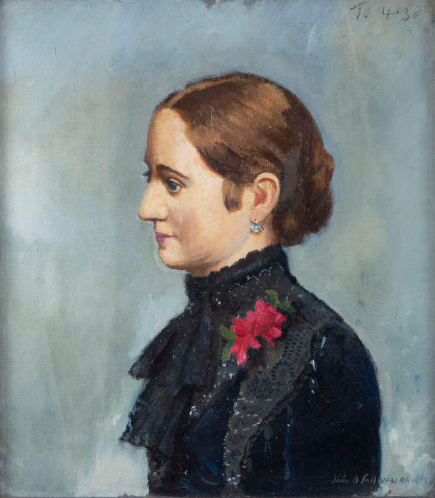 It was the last portrait to be painted by the artist who died from pneumonia soon afterwards aged just 44. 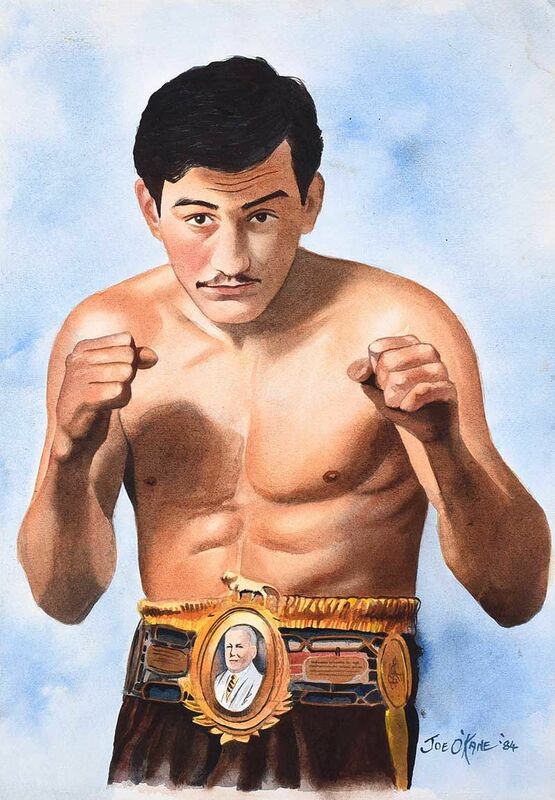 Apparently, the painting was adjudged the best representation of Hone by those that knew him. “Let us be Friends” oil on canvas (18″ x 14″). 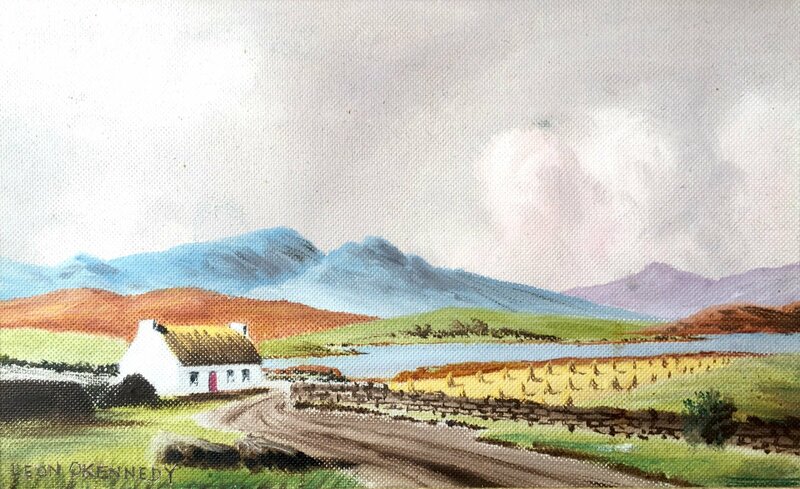 Sold at Adams – 4/12/2012 for €8,000.00. 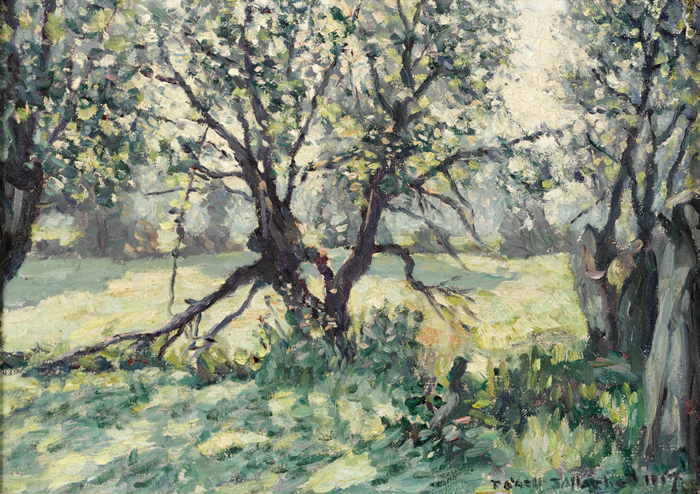 Born in Cork, Henry O’Shea studied Art at the Cork School and then moved to Limerick to work at the School of Arts & Crafts. 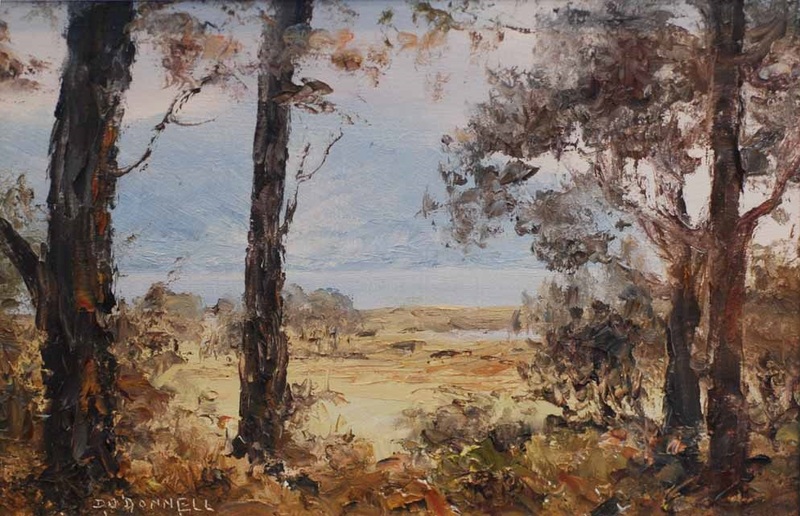 Later he established himself as a photographer and portrait painter at 117, O’Connell Street in the city. 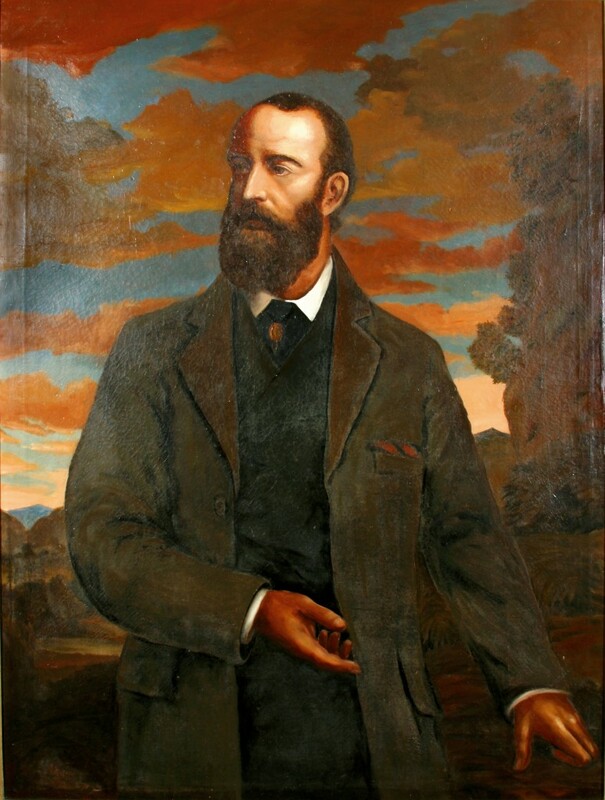 He painted many religious and other notable figures of the day including Charles Stewart Parnell (below). He remained in Limerick and died at his premises on O’Connell Street on the 4th June 1907. Judging by the ‘who’s who’ of people that attended his funeral he was a very well respected member of the community. 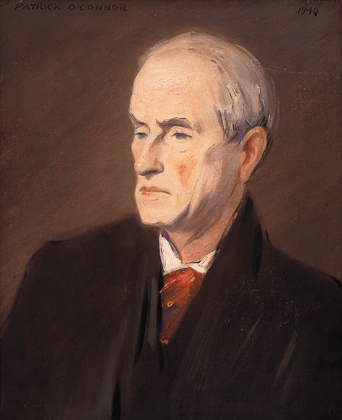 Portrait of Parnell, oil on board (44.5″ x 33.5″) – Wexford County Council Art Collection. 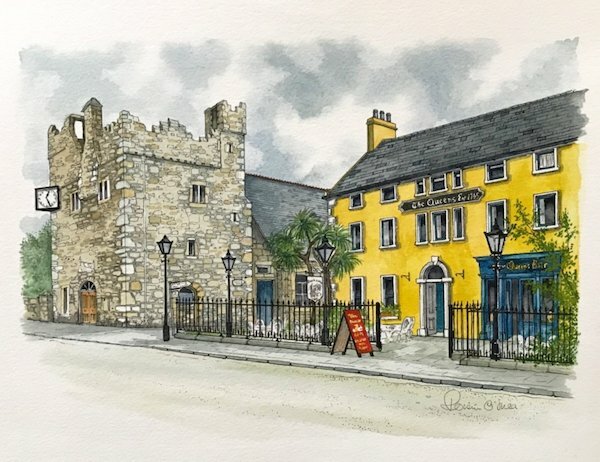 “The Queen’s Pub, Dalkey, Co.Dublin” watercolour (9″ x 12.5″). 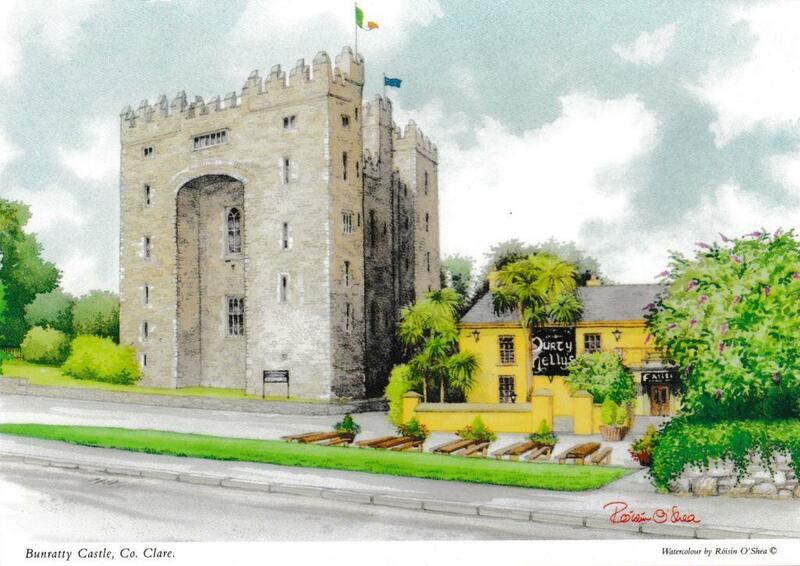 Left to right: “Malahide Castle, Co.Dublin” watercolour (11.5″ x 14.5″); and a John Hinde postcard of Blarney Castle and Durty Nelly’s Pub. 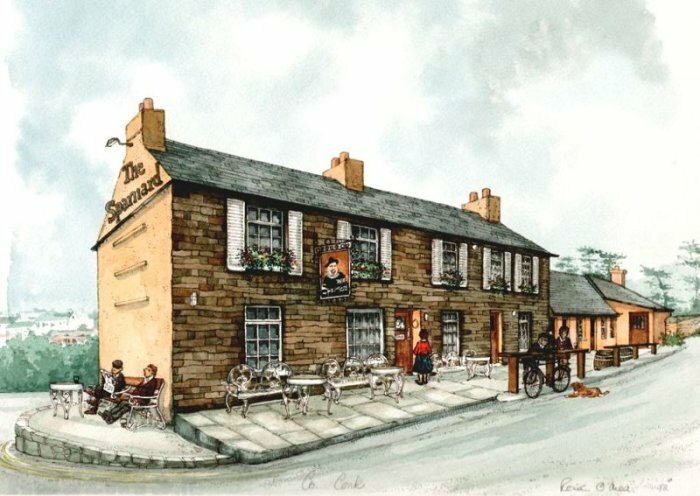 “Spaniard Pub, Kinsale, Co. Cork” watercolour (8.5″ x 11″). 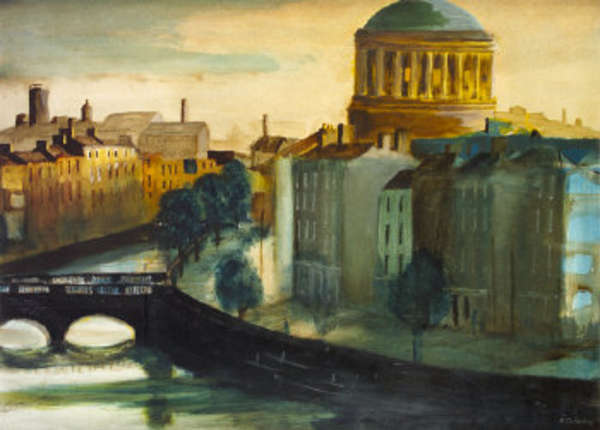 Donal O’Sullivan was a Dublin born artist. 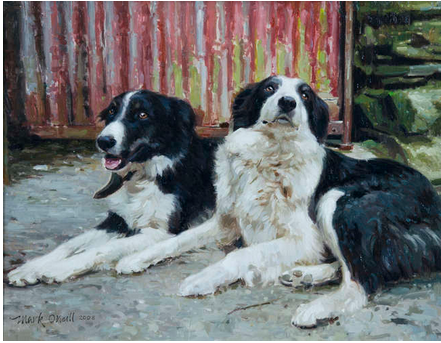 He first studied architecture at DIT, before moving to the NCAD to take up sculpture ultimately turning to painting where he specialised in portraiture. 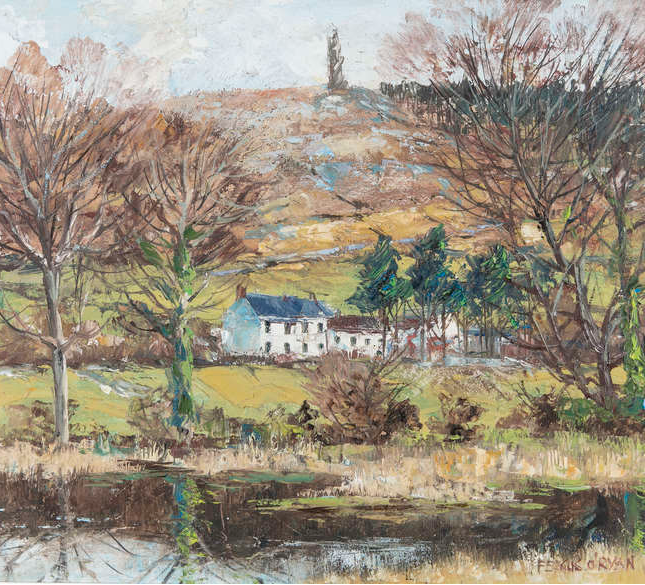 He was dedicated to his craft and refused to paint anything except what he chose – regardless of its saleability. Despite a number of sell-out shows in the late 1960s he fell out of fashion for some years, and eventually suffering from delicate mental health took his own life in 1991. 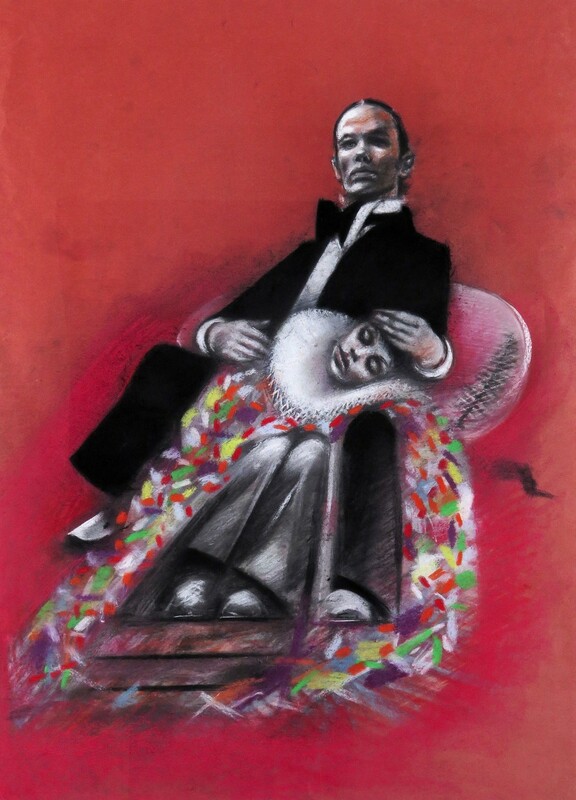 Left to right: “Veiled Woman” pastel on buff coloured paper (20″ x 14″), sold at Whyte’s – 4/10/2010 for €450.00; and “Liza Minelli and Joel Grey from the film Cabaret” pastel on red paper (33″ x 23″), unsold at Woolley & Wallis, Salisbury, Wiltshire – 6/6/2018. Left to right: “In the Park” (35″ x 23″); and “The Voyage” both oil on canvas (31″ x 23″). 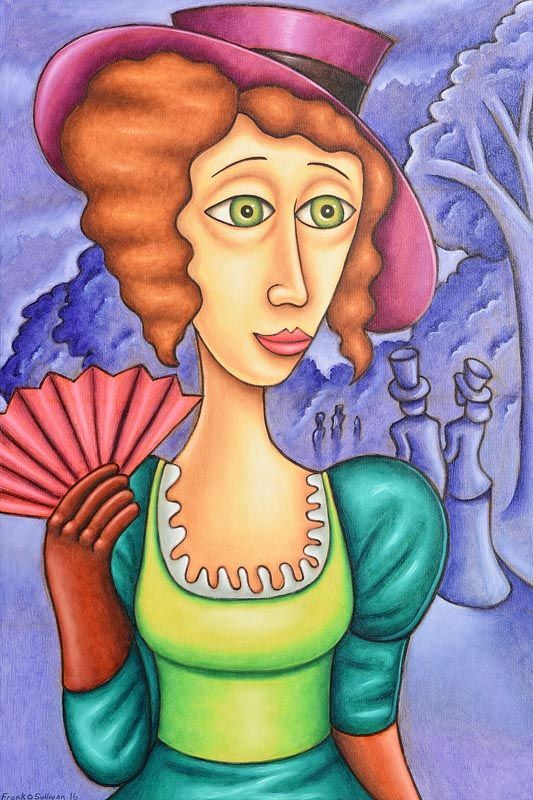 Sold at Morgan O’Driscoll’s – 2/8/2016 for €120.00 and €280.00 respectively; “Cappuccino Girl” oil on canvas (24″ x 18″), sold at Morgan O’Driscoll’s – 3/10/2016 for €100.00 and finally “Winter Street” acrylic on canvas (39″ x 30″), sold at Morgan O’Driscoll’s – 13/3/2017 for €460.00. 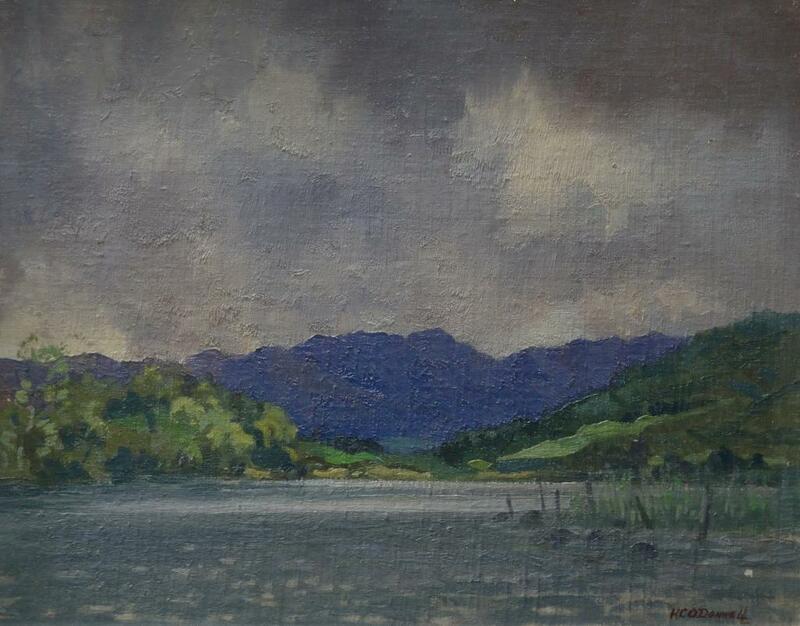 “Lady’s View, Killarney” oil on canvas board (11″ x 17″), sold at Morgan O’Driscoll’s – 6/11/2017 for €120.00. 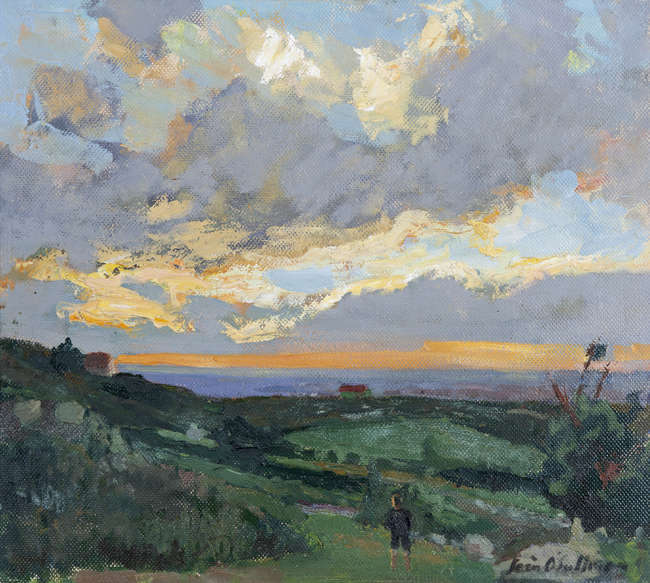 “Overlooking Calary Bay at Sunset” oil on board (17″ x 19″), unsold at Adam’s – 7/12/2016. Left to right: “Portrait of a Girl” pastel (17″ x 13″), unsold at Morgan O’Driscoll’s – 22/5/2018; and “Portrait of a Lady in a Black Lace Dress” oil on canvas (18.5″ x 16″), unsold at Adam’s – 27/3/2019; and “Portrait of Mrs. R. Smyllie, in a West of Ireland Landscape” dated 1943, oil on canvas (30″ x 25″), sold at Adam’s – 27/3/2019 for €2,000. “Cill Rhilig, Kerry” oil on canvas (16″ x 20″), unsold at Mullen’s (Laurel Park) – 12/3/2018. “The Delphi Fishery, Galway” oil on canvas (20″ x 30″) sold at Ross’s – 10/8/2016 for £260.00. 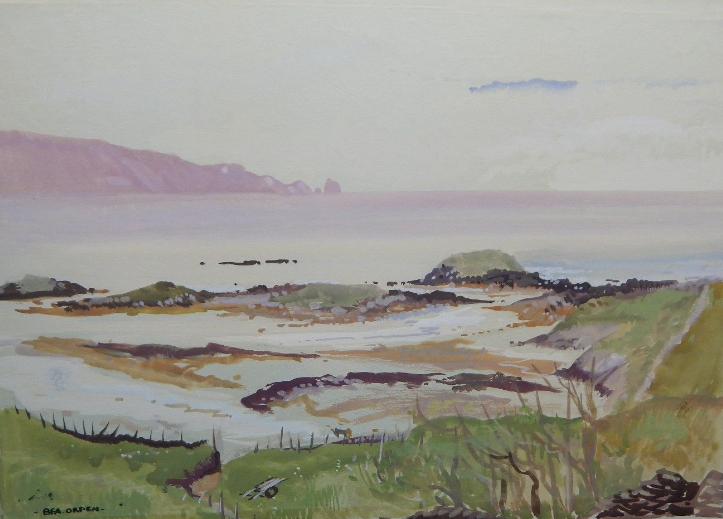 Left to right: “Near Roundstone, Connemara” oil on canvas board (10″ x 16″), unsold at Morgan O’Driscoll’s – 30/1/2017; and “Muckish from Innisbofin Island, Co.Donegal” oil on board (6″ x 9″), sold at Morgan O’Driscoll’s – 6/11/2017 for €320.00. 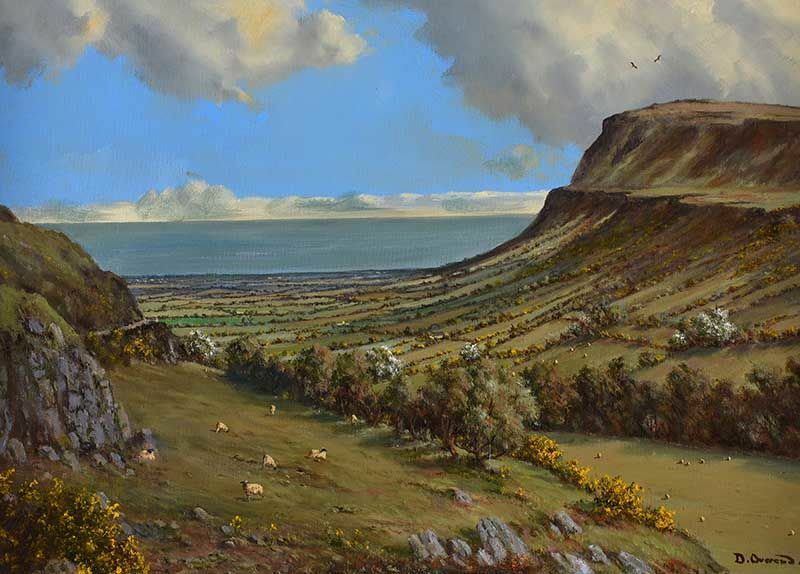 “Glenariff, County Antrim” oil on canvas (16″ x 22″), sold at Ross’s – 21/2/2018 for £340.00. 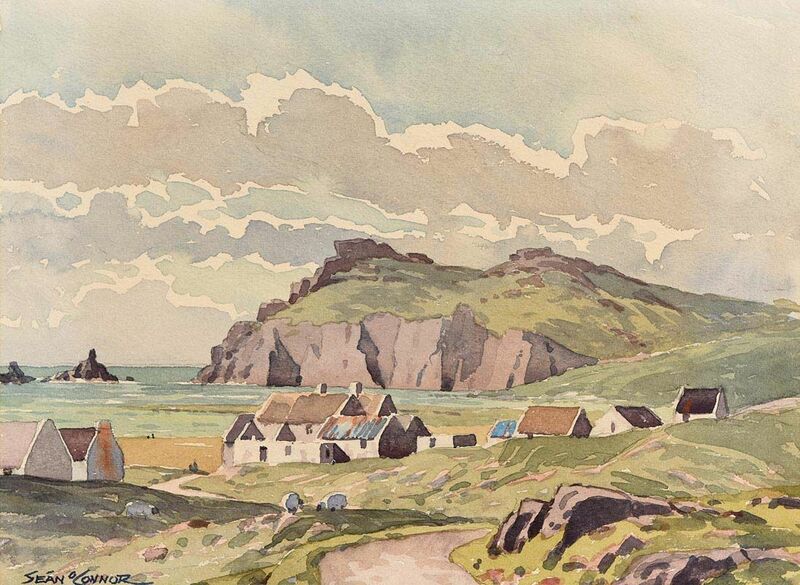 “Ballintoy Church, Co.Antrim” oil on canvas (16″ x 24″), sold at Morgan O’Driscoll’s – 2/7/2018 for €650.00. 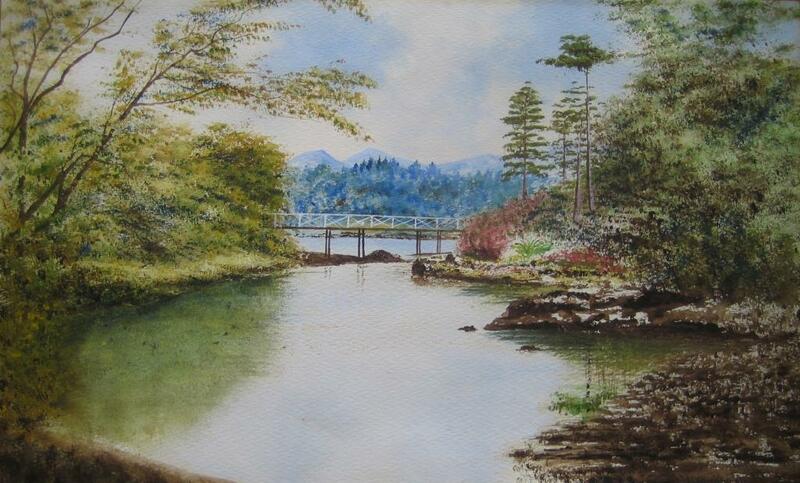 “Nearly Home” watercolour (15″ x 11.5″), sold at Whyte’s – 9/12/2012 for €140.00.